The response to the Japanese Cooking 101 announcement has been very encouraging! I'm glad that so many of you want to learn about making Japanese food from scratch. As promised, here is the list of required ingredients that I would like you to have ready for the course. Unfortunately most Japanese ingredients are rather expensive, but on the plus side this will form the nucleus of an authentic Japanese pantry after the course is finished, since we'll only be using a small amount of each. The fresh ingredients needed will be announced before each lesson, but for this course I will be sticking to things that should be easily obtainable in most of the world, at any tme of the year, so you shouldn't have any problems there. I've put together a section on my Amazon.com aStore that lists these ingredients. You don't have to buy them from Amazon of course, but you may find it useful to take a look anyway for a visual of the ingredients. This is available at Japanese grocery stores. 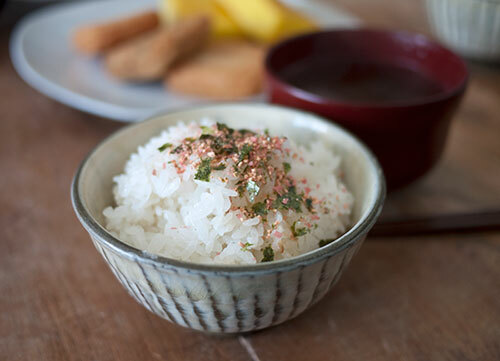 Make sure you get "japonica" rice, not "sweet" rice or "mochi" rice. Rice listed as "sushi rice" is ok. For this course, please don't substitute other kinds of rice or it will defeat the purpose. (And we'll be using white rice rather than brown rice since that's the baseline.) 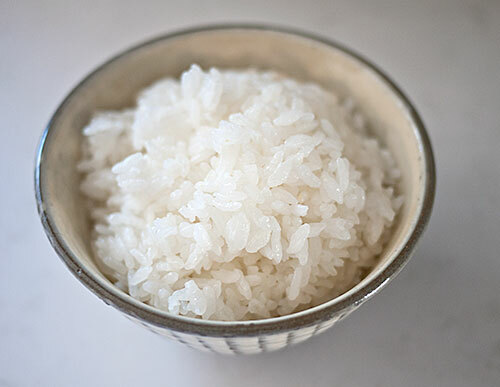 These days Japanese style rice is grown in the U.S. (mainly in California, but also in places like Arkansas) as well as in Europe (Italy and Spain), and various parts of Asia. I've not bought any Asian-grown Japanese rice myself, but all the U.S. or Europe grown Japanese rice brands I've tried have been fine. Japanese-grown rice is quite expensive although it's really top quality. In the U.S. two well known and well priced brands are Nishiki and Kokuho Rose. Of these to I personally prefer Nishiki. 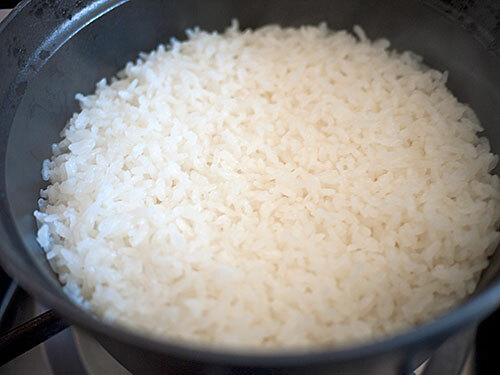 If you can afford it, Tamanishiki and Tamaki rices are better quality. I've listed different pack sizes of all three rices on the aStore page. 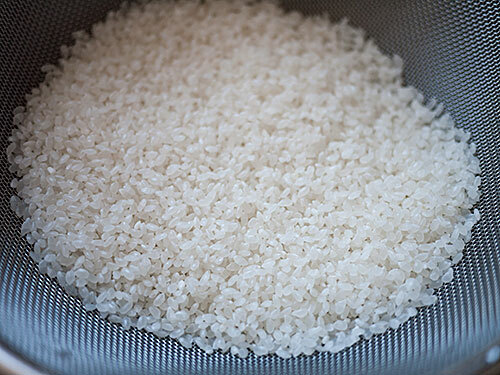 The most frugal option is to get a 2.2 lb / 1 kg bag of Nishiki rice. 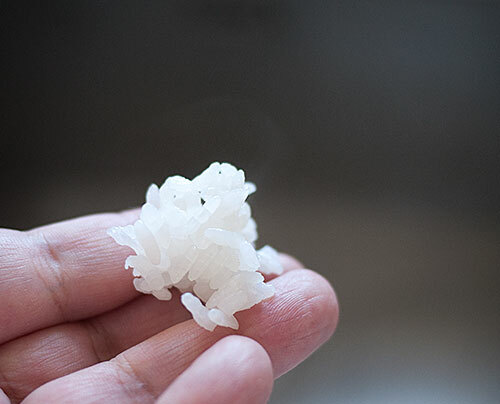 In the U.K. and Europe, rice types like Yumenishiki and Yutaka are grown in Spain and Italy. I've tried both, and slightly prefer Yumenishiki, which is now our everyday white rice. Japan Centre (who ship all over Europe) carries both, as well as several Japan-grown rices and Nishiki and Tamanishiki from the U.S. 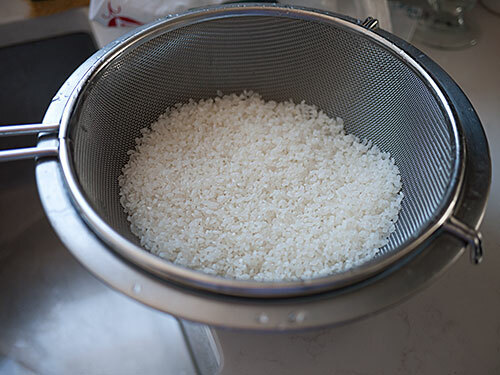 The reason why I'm requiring this is that I want to make sure that you know what Japanese rice should look and taste like when it's properly cooked. I don't really trust the quality of rice at every "Japanese" restaurant around - I've had some pretty awful rice at some - and believe it or not these microwaveable rice packs are pretty good quality. 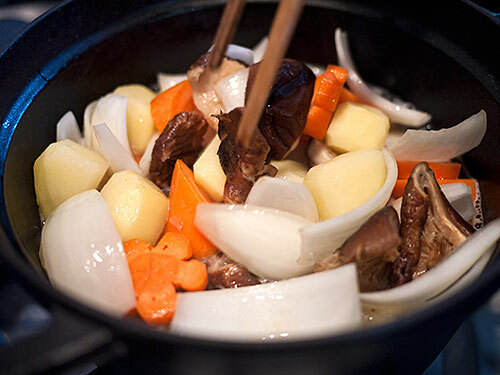 Essentials for making dashi, which is the foundation for most savory Japanese dishes. Another essential for making proper dashi stock. Don't bother with the tiny little 6-packs - that's meant to be used as a sprinkle on top of food. Get a bag filled with large, puffy flakes if at all possible. Again I refer you to the aStore page for a visual. If you cannot get either katsuobushi or konbu seaweed, dashi granules like Hon-dashi (an Ajinomoto brand) is better than nothing. Keep in mind that dashi granules have added salt, MSG and other things, so you will have to adjust your recipe accordingly. 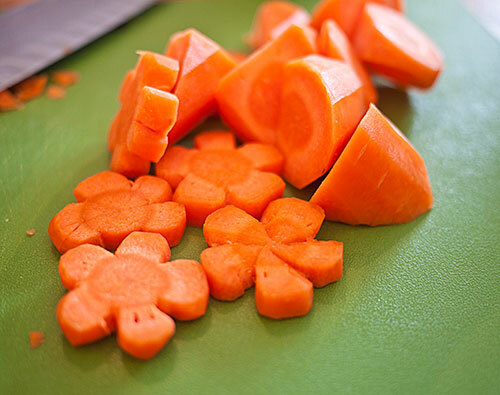 Used in soups and salads. 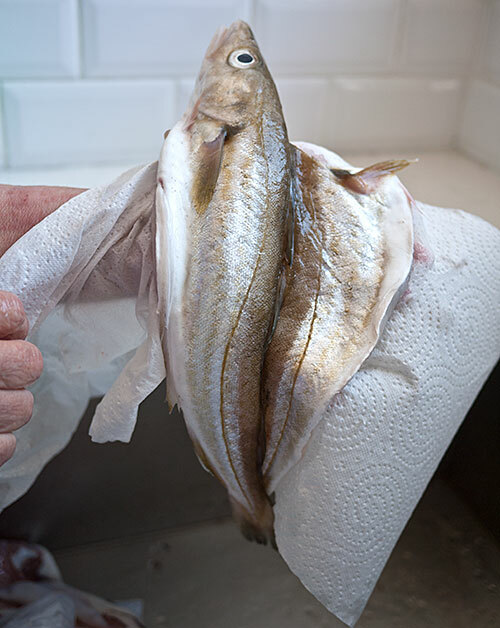 You can usually just get the dried version, but if you're lucky enough to get the fresh, salted kind, let me know and I can tell you how to handle it. The reason why I specify a Japanese brand is that soy sauce formulas differ a little from country to country. Two well known Japanese brands of soy sauce are Kikkoman and Yamasa. I prefer Yamasa but either is fine. A non-Japanese company that makes Japanese-style soy sauce is ok too. Sake is used in many Japanese dishes. I much prefer to use a regular sake, but if you can't get it using ryouri-shu or cooking sake is acceptable. 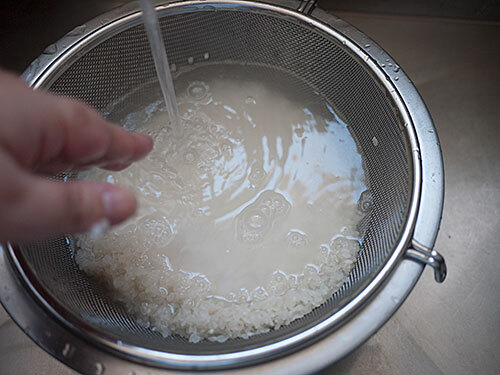 Keep in mind that cooking sake has salt (and sometimes other things) added to it so you must adjust the salt in your dish accordingly. Note: The question of substitutions for sake in cooking is addressed here. Hon-mirin is an alcoholic beverage that is used exclusively in cooking. Aji-mirin or mirin flavored seasoning is what it says - not real mirin, but fairly close, and containing less than 1% alcohol. Get hon-mirin if you can, but aji-mirin is acceptable. 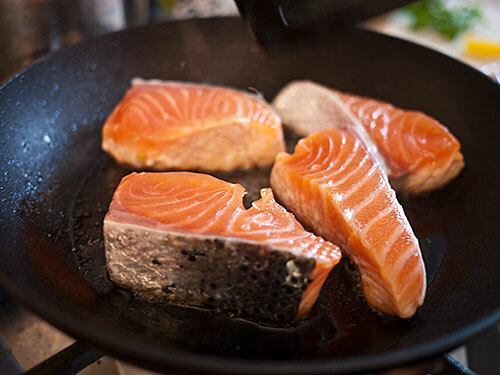 Note: The question of substitutions for mirin in cooking is addressed here. The standard vinegar used in Japanese cooking. Mild and slightly sweet. Used for miso soup and a lot more. White miso is milder and less salty usually than red miso; blended miso is a great all-purpose miso. See Japanese Miso Primer for more about miso. By fine-mesh, I mean a steel wire mesh rather than the kind of colander that is made of a sheet of metal with holes punched through it. 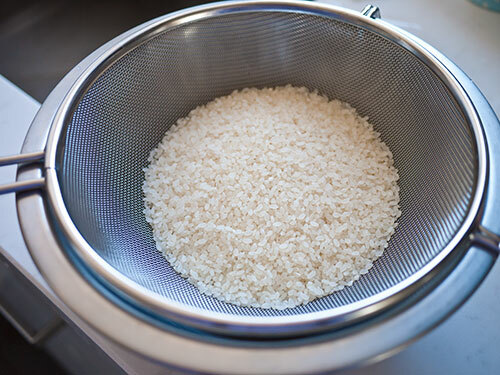 This is used for rinsing rice efficiently. Again, I've listed an example on the aStore page for reference. Any of these can be used for cooking rice. Please have at least one of them ready. 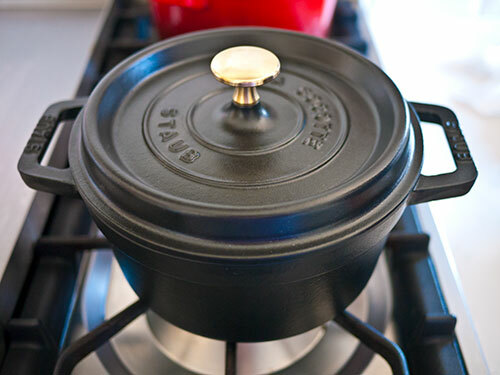 For boiling, making soup, and so on. 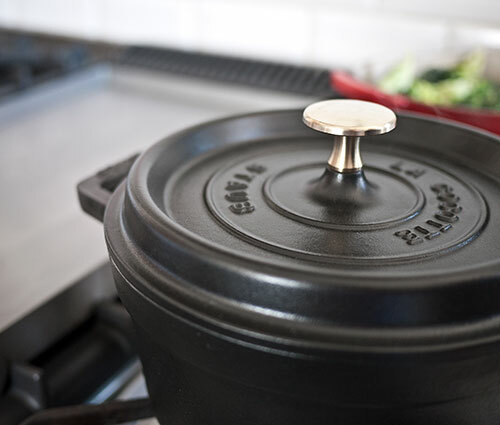 The big kind you use for cooking, not a fancy little soup-tureen one. 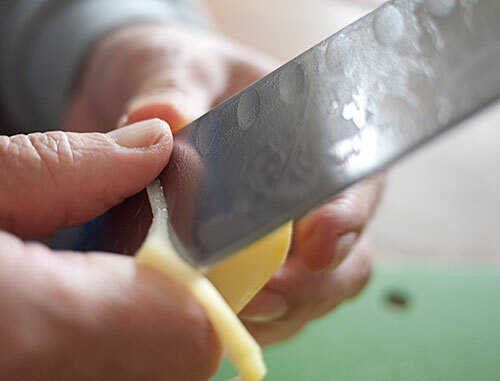 A regular chef's knife or santoku knife is fine; no need for a special Japanese one. 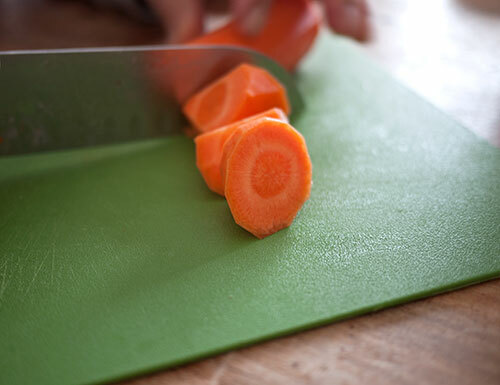 You should also have a cutting board. This is not mandatory, but it's very handy to have around for all kinds of Asian cooking. Again, not mandatory, but handy to have. For presenting your final complete Japanese meal. You certainly do not have to go out and get specialized Japanese dinnerware for this (unless you want to) - just use what you have. So there you have it. If you have any questions let me know in the comments. Welcome to the first lesson of Japanese Cooking 101! 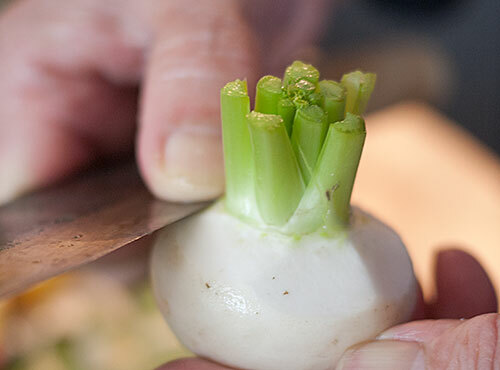 Throughout this course I hope to teach you about the foundations of traditional Japanese cooking or washoku (和食), as well as how to cook some Japanese dishes. So let's get started! 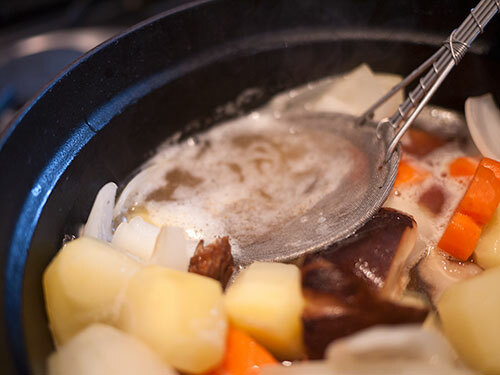 Dashi or stock (often called dashi stock, which is kind of redundant) is the foundation of all savory washoku. It's not just used in soups; it's used in everything, from sauces, dressings, as a liquid when stewing vegetables, and more. Without dashi, your Japanese dishes simply aren't right. 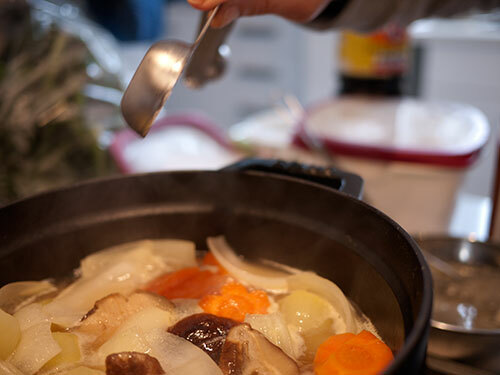 If anything, dashi is more critical to Japanese cooking than meat, vegetable and fish stocks are to French cooking. So what is dashi? Basically it is a liquid that is packed with umami, or glutamates. 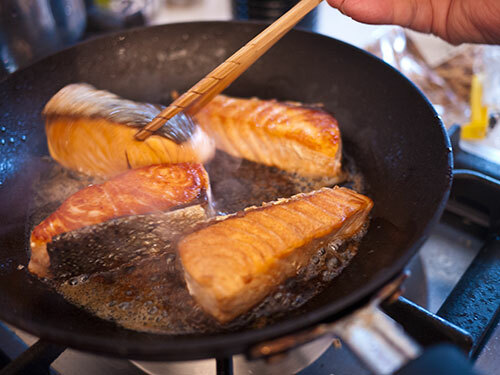 Umami is an essential part of any savory cuisine, but particularly so in Japanese cooking. It's not at all surprising that it was a Japanese scientist who invented the purest chemical form of umami, monosodium glutamate (MSG). While using MSG or a instant dashi powder or granules is very handy, and although the quality of dashi powders have have improved in recent years, dashi made from time-tested, natural ingredients is more rounded and better tasting. The difference between dashi made from instant powder and one made from scratch is like the difference between a bouillon you make with a stock cube and one you make by simmering bones and vegetables for hours. 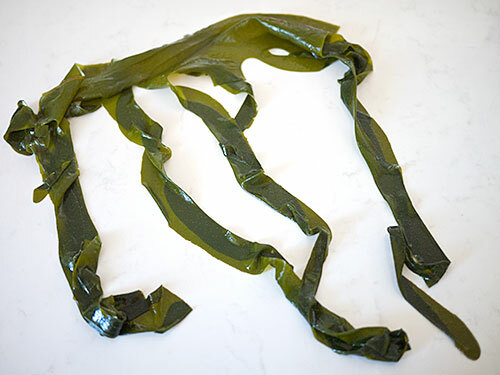 kombu seaweed is a slightly leathery seaweed. It may come in wide sheets, or long ropey strands. 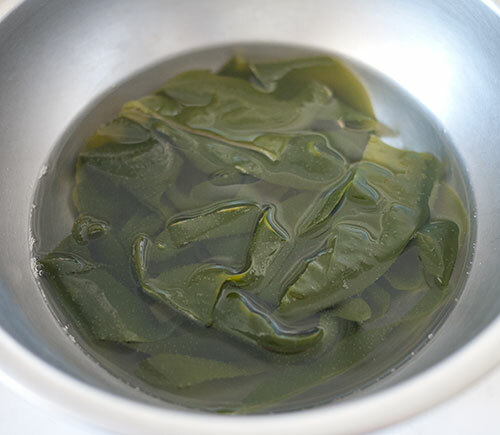 kombu is the most widely used dashi ingredient, and has the most neutral flavor of them all. 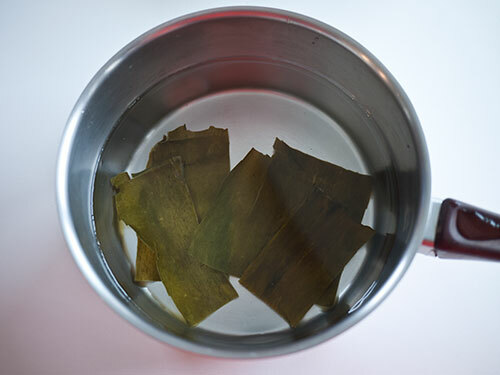 If you are a vegan, a pure kombu dashi is an all-purpose, neutral tasting dashi. 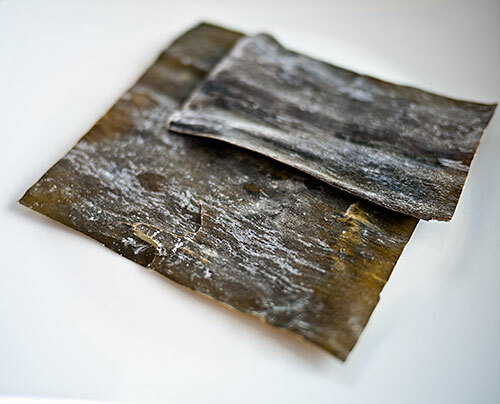 Good kombu is covered on the surface with a fine white powdery substance. Do not wash this off - it's not caked on salt or dust! It's full of that umami we want to extract. Also called kezuribushi or okaka. Katsuobushi is a bonito fish (katsuo) that has been dried and fermenented to develop a lot of umami. The fish shrinks down and hardens until it's like a block of wood. 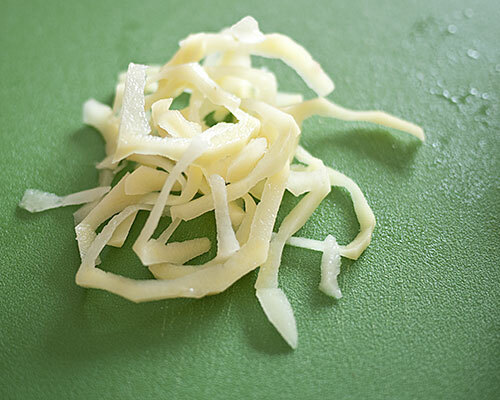 This is then grated or shaved into thin flakes, rather like wood shavings. The shavings are used in cooking. Good, fresh pre-shaved katsuobushi is fluffy and yellowish-beige in color with a hint of blush pink. 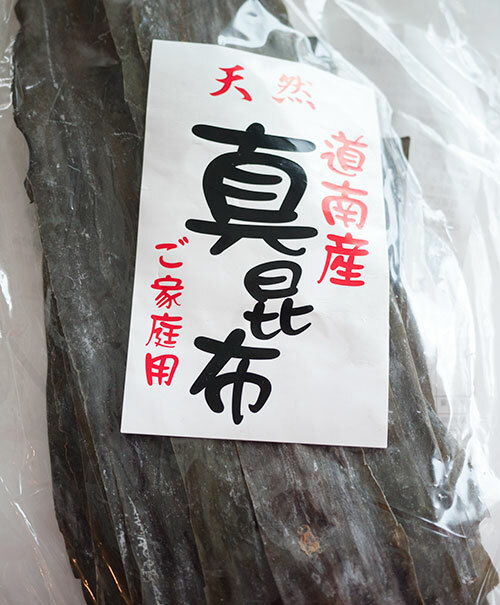 Katsuobushi is the second most common dashi ingredient after kombu. Most of the dashi used around the country in restaurants uses a combination of kombu and katsuobushi. 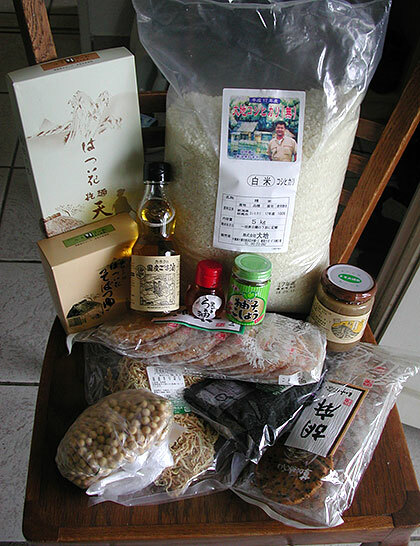 We won't be using these ingredients for this lesson, but these items are used in dashi too. 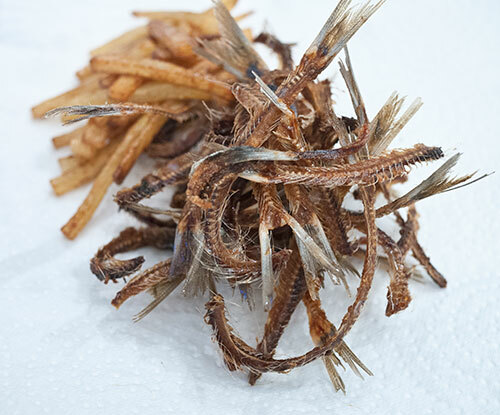 Small dried fish such as nishin or iwashi (にしん, いわし: herrings and sardines) are often used instead of katsuobushi. 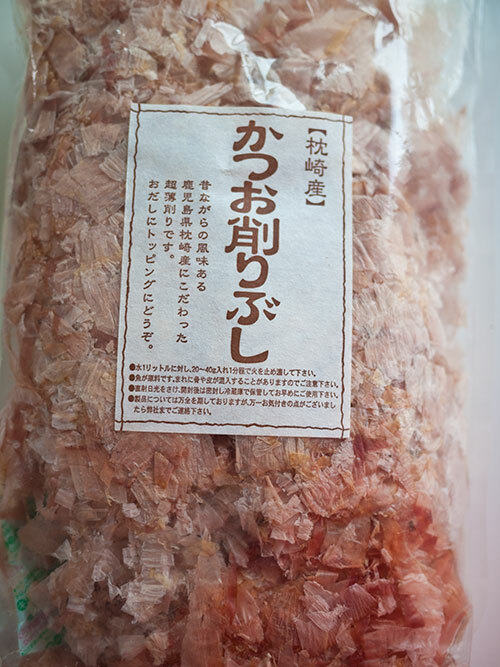 Some regions of the country prefer them over katsuobushi, and some people just use them because they are cheaper. 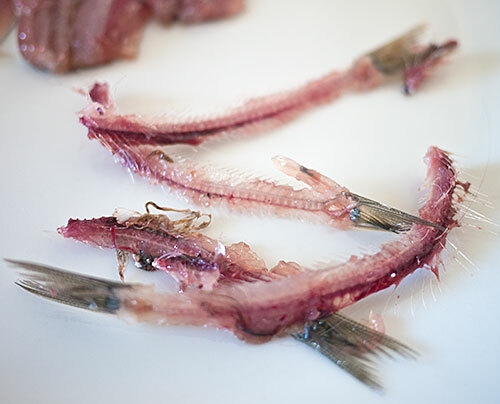 The dashi made with these don't taste overly fishy, but are a bit more fishy than katsuobushi. 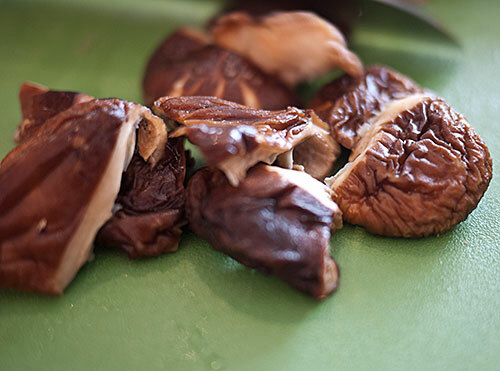 Dried shiitake mushrooms (干し椎茸) are used for dashi on occasion. The soaking liquid from reconstituting dried mushrooms makes a very strong tasting dashi, which can be used on its own or with kombu dashi. Simply put, ichiban dashi or first dashi is the dashi you make from fresh (as in previously unused) ingredients kombu and katsuobushi. Niban dashi or second dashi is dashi made from the kombu, katsuobushi and so on that has previously been used for making ichiban dashi. Ichiban dashi is used for things like soups, or when you want the maximum amount of umami possible. 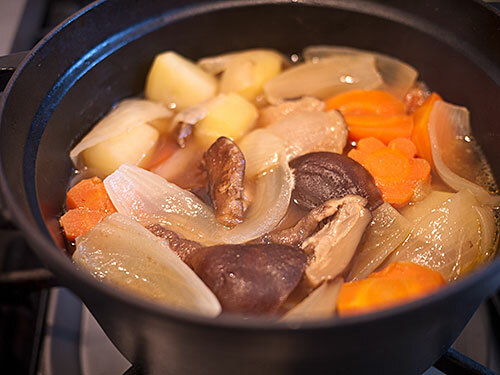 Niban dashi is used for things like stewed dishes, when other ingredients like meat and vegetables will add more umami to the dish so a subtler dashi is adequate. Niban dashi is really a way of being frugal with your dashi ingredients. 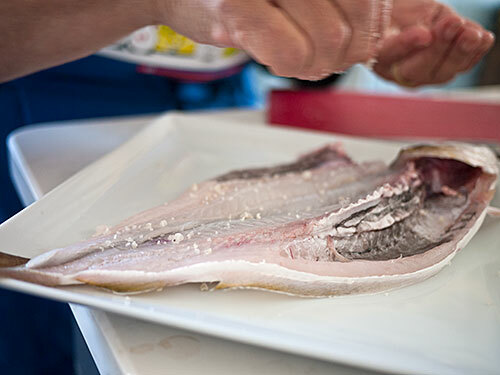 In this lesson we will be making a standard ichiban (first) kombu and katsuobushi dashi, but I'll also show you how kombu-only dashi is made. 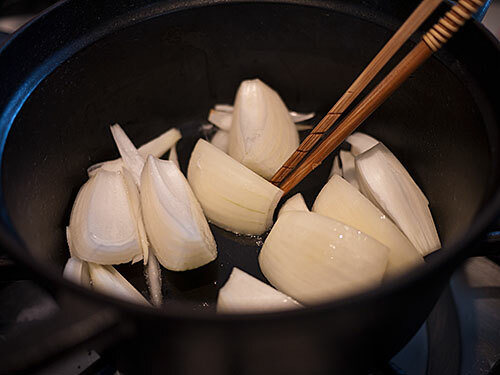 Long time readers of the site may know that I've given you a couple of different ways of making dashi in the past. They all work well, but here I'll walk you through the method that I think makes the best tasting dashi. 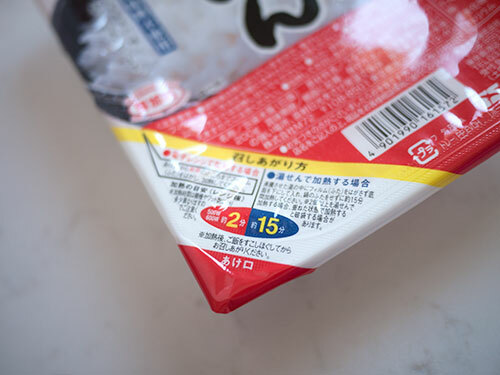 The ratio of water to ingredients: Allow for a minimum of 10 grams of kombu, and 10 to 15 grams of katsuobushi, per 1000 ml(1l) or 4 U.S. sized cups of water. 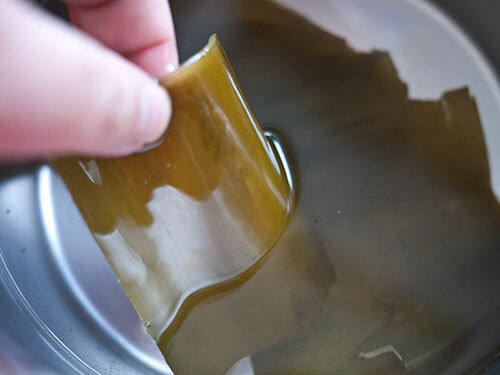 If you're making a kombu-only dashi, you'll want to use at least 15 grams. If you don't have a fairly precise scale, 10 grams of kombu is about a 4 inch square piece - which is the advice I've given you previously, and 19-15 grams of katsuobushi is a good handful. Here I used 15 grams of each. If you don't get the amounts precise don't worry; since these are all-natural ingredients, you can't really use too much of it. Here's 15 grams of kombu. - about 1 1/2 4-inch / 10 cm squares. Set aside the katsuobushi. 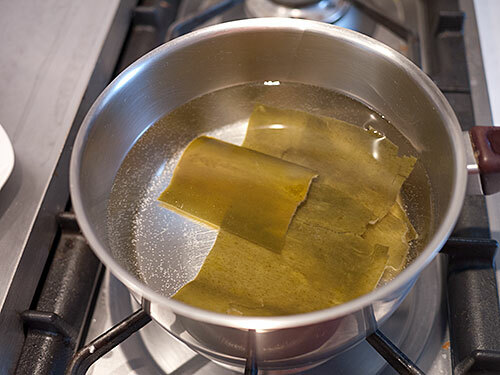 Put the kombu and water in a pan and leave it to soak for at least 30 minutes. You can leave it in the water for up to a day in the refrigerator, if you want to do the soaking step in advance. If you want to track how the dashi progresses, take a small sip of the liquid after the kombu has been soaking in it for a while. You should taste just a hint of the sea already. The surface of the kombu will have turned a bit slippery. Put the pan on the hob and turn up the heat. Bring it to a boil, then lower the heat. 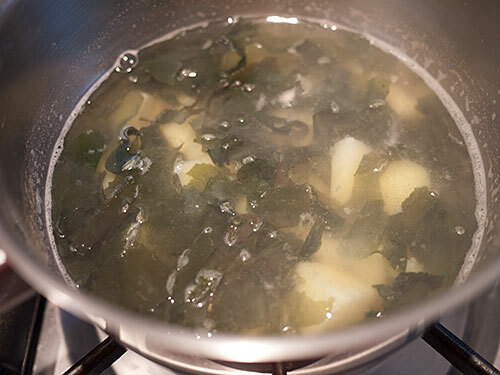 If you are making a kombu-only dashi, keep the pan on a barely-there low simmer for 30 minutes. Check the water level and add a bit more if it seems to be evaporating too fast. 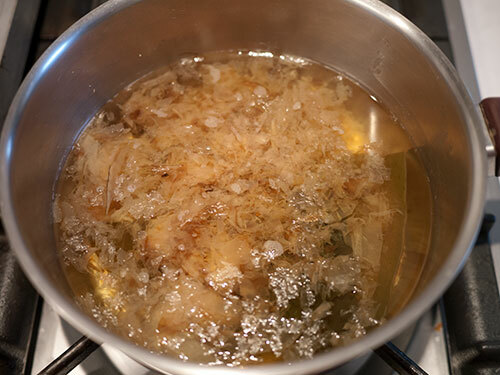 IF you are making a kombu-katsuobushi combination dashi, simmer the kombu for 10 minutes, then turn off the heat. Again, if you want to track the progress of the dashi, taste it at the 5, 10 and (if you're going for kombu-only dashi) the 30 minute stages. 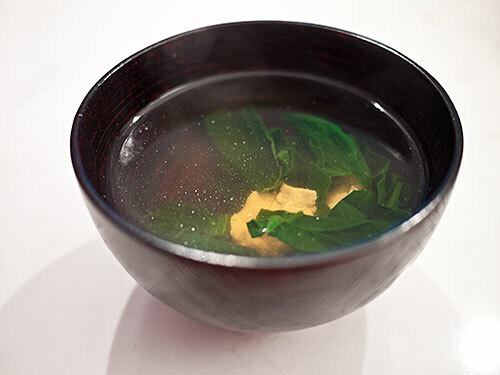 You'll notice that the dashi is getting gradually stronger in flavor, tasting like the sea. You should notice the umami even at the 5 minute mark. 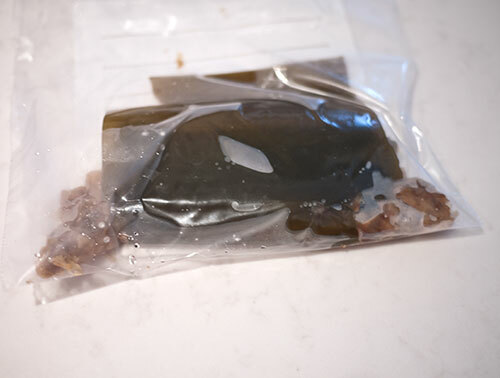 Kombu-only dashi barely has any color. To make a kombu-katsuobushi combo dashi: After 10 minutes of simmering, add the katsuobushi, and turn the heat off. Let the pan sit for a few minutes (about 10 minutes) until the katsuobushi sinks to the bottom of the pan. 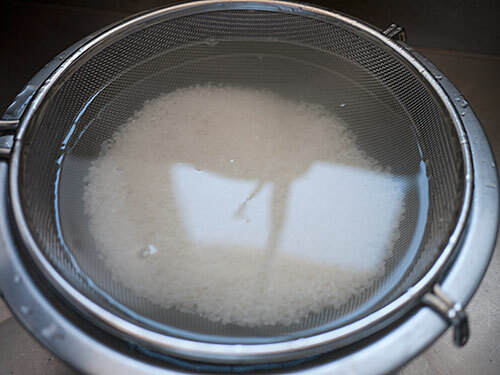 Strain off the liquid, using a fine-mesh sieve. 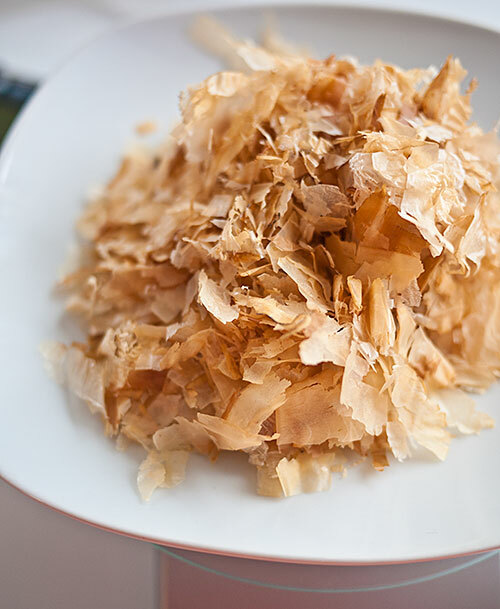 Don't throw away the used kombu and katsuobushi! We'll be using that in a later lesson, so put it in a plastic bag and store it in the freezer. The dashi will have a pale golden color. Give it a taste - you'll notice the katuobushi, but it won't be unpleasantly 'fishy'; it will be like a very light bouillon without the salt. At this point the dashi can be used right away, or stored well covered for a few day in the refrigerator. 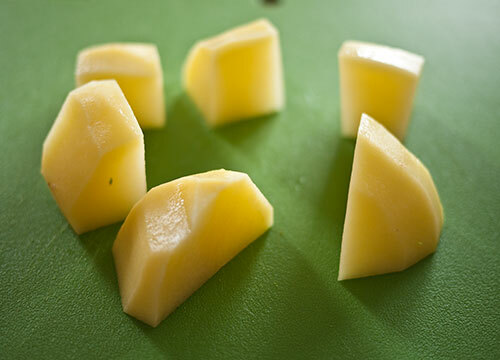 You can also freeze it - putting it in ice cube trays is a handy way of doing this. 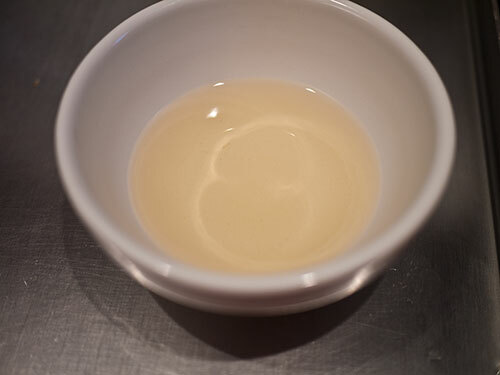 _This pale golden liquid is the foundation for your savory Japanese dishes. 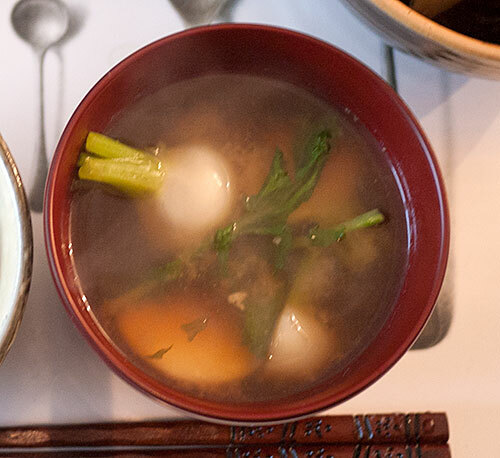 Master the art of dashi making and you're well on your way to becoming a Japanese Iron Chef! Tomorrow I'll show you how to turn this dashi into two kinds of soup: clear soup called osumashi or osuimono, and misoshiru or miso soup. A complaint I hear sometimes about dashi made from dashi granules is that it is 'fishy'. While they do have some fish flavor (and the granules themselves, especially certain brands, can smell rather fishy) since they are made from katuobushi extract and such, I suspect that one problem is that people are using far too much of it. You only need to use about 1 teaspoon per 4 cups (1 liter) of water, or 1/4 teaspoon per cup. 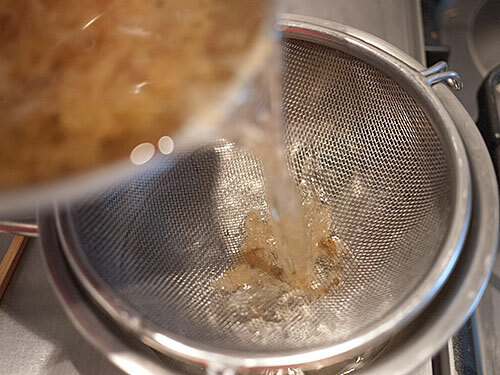 Dashi, whether made from granules or from scratch, is not meant to be used on its own; it is meant to be a flavor enhancer, not the entire flavor. You add other ingredients like salt, soy sauce, sake and so on to the dashi to "complete" the flavors. So trying to make add enough dashi granules to water or other liquid to make it 'strong' will not turn out well at all. When you use dashi granules start with a small amount, add the other flavors and then add a bit more if you think it really needs it. 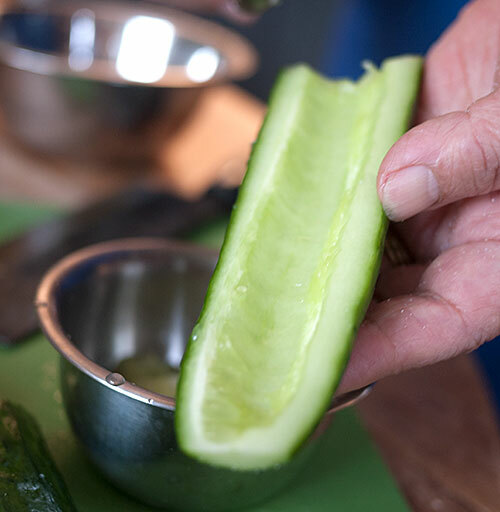 Tasting as you go along is the best way to cook something you're unfamiliar with. 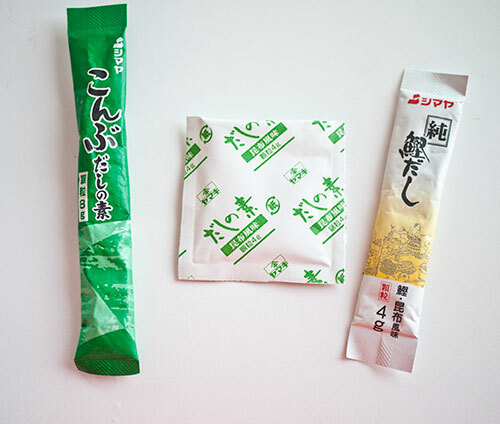 Dashi granules that come in pre-portioned packages like these are handy if you can't remember the dosage. These little sealed packages tend to keep better too. But again, if you can get the real ingredients, please try to make dashi the proper way at least once, so you can know what it's supposed to taste like. 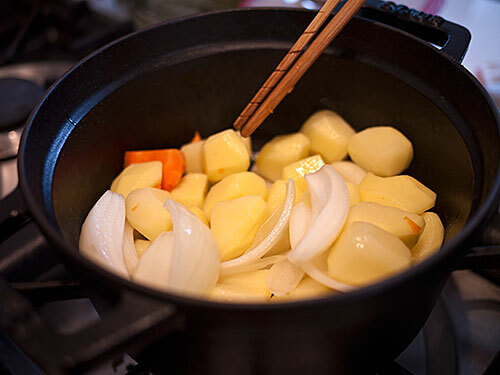 For this lesson I will be using one ingredient, potato, that should be familiar to anyone, and another, wakame seaweed, which may be more unusual but is a standby in Japanese kitchen. It also gives me a chance to show you how to handle miso soup additions that have different cooking times. 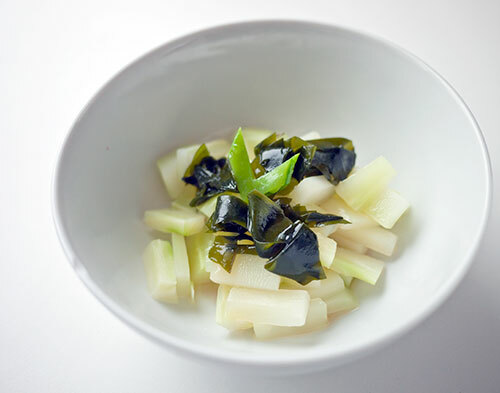 Wakame (わかめ) is very different from kombu, but is probably the second most used seaweed in Japanese cooking. 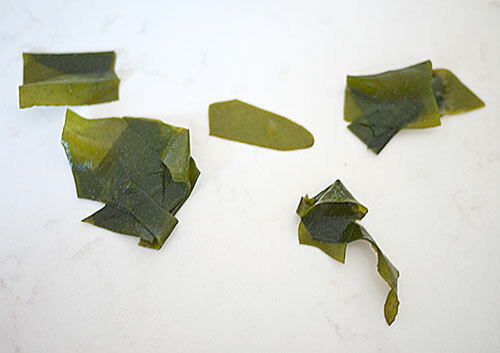 Unlike kombu wakame doesn't have a whole lot of umami, although it has a pleasant sea-flavor. It's enjoyed more for its texture, which can be kind of chewy and squeaky when raw, or soft once you cook it even briefly. 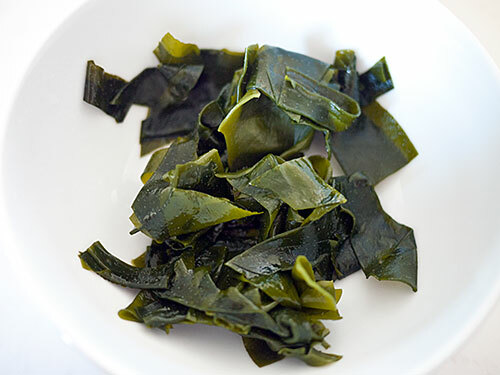 Dried wakame expands to 4-5 times its volume when reconstituted, so use sparingly. Dried wakame usually comes already chopped up, so all you need to do is to take out some and reconstitute in cold water is using in salads or side dishes. For soup you can just put it directly into the soup. Fresh wakame packed in salt should be stored in the refrigerator. 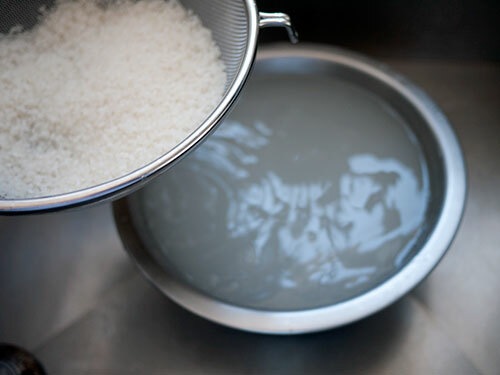 Before using, rinse off the salt under running water, then blanch briefly by pouring boiling water over it. If using in a salad, refresh in cold water. 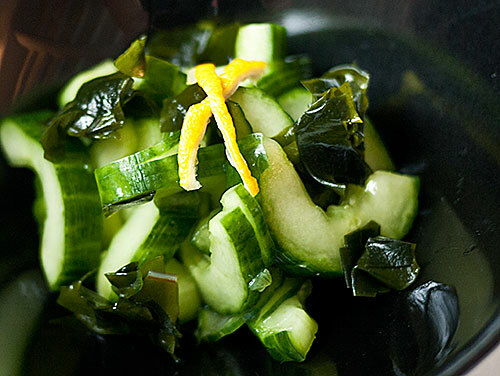 Fresh wakame comes in long whole strands, so you need to chop it up before using. It also expands a bit (about 1.5 times or so) so don't pull out more than you need from that tangle in the packet. For this miso soup I used a white Shinshuu miso. Shinshuu is the old name of Nagano Prefecture, and is known for its excellent miso. It's fairly mild on the saltiness scale. Every miso has a different level of salt, and the worst thing you want to do is to add too much miso to your soup. 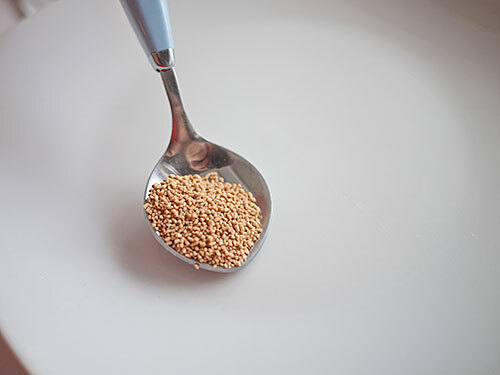 A general rule of thumb is to use about 1 tablespoon per cup (U.S. measure, 236.5ml) or 1/4 l (250ml) but if you have a very salty red miso for example, you may need less. So when you are trying out a new miso, always add less than you think you need. It's easy to add more. Since we'll be using 1000 ml / around 4 cups for this recipe, we'll start with 3 tablespoons and add more if we think we need it. Bring the dashi up to a boil, and add the potato. 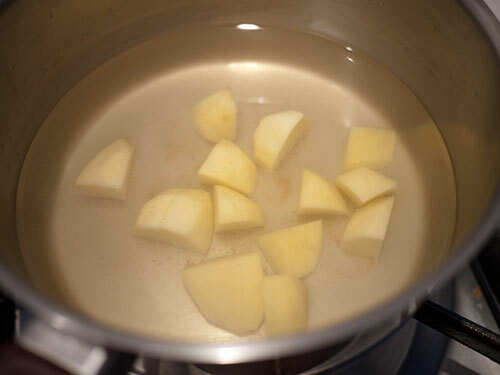 Lower to a simmer, and cook until the potatoes are soft, around 10 minutes depending on how big the pieces are. In the meantime, if you're using fresh wakame, process it as detailed above. 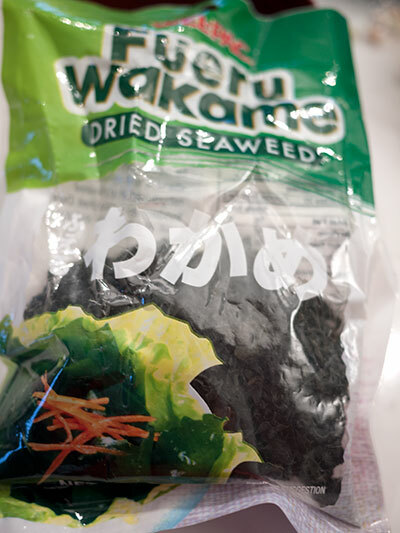 Dried wakame can just be thrown in there without reconstituting. When the potato pieces are tender, add the wakame. 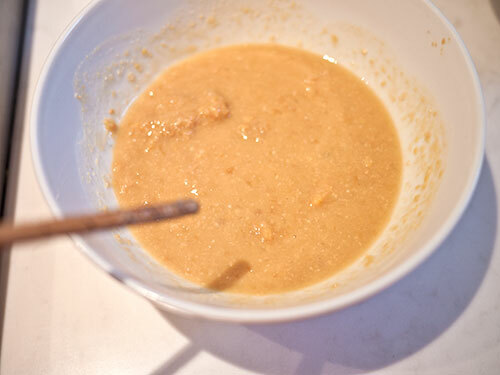 Put the miso paste in a bowl and add some of the liquid from the soup. Add the dissolved miso to the soup, then immediately turn off the heat. Miso should not be boiled, or it starts to turn a bit grainy. (Mind you it will still taste fine, so if this happens to you don't throw away your soup or anything). Taste your soup, and if needed add a bit more dissolved miso. Serve in a bowl. The combination of potato with soft wakame is really homey and delicious. Take your time to inhale the aroma of the soup. If you serve this to a homesick Japanese person they may cry in gratitude. Tip: If you can't get wakame, you can use some shredded spinach (as I used in the clear soup below) instead. Cook any hard ingredients until tender in the dashi. Add no-cook or almost-no-cook ingredients at the end. Always dissolve the miso before adding to the soup, using some of the dashi in the pot. Add less miso than you think it needs, then add as needed. 1 tablespoon = 1 U.S. cup or around 250ml of dashi is a fairly good baseline, but all misos are different. Never let miso soup boil after adding the miso. Delicate clear soup or osuimono may seem even easier to make than miso soup on the surface, but getting the flavor balance just right can be a bit tricky. A clear soup really must have a great tasting dashi as a base. 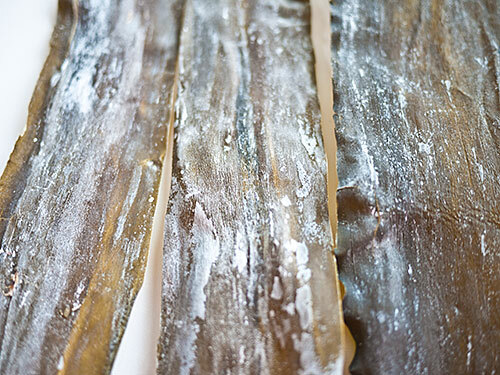 Many cooks prefer to use a kombu dashi which is more subtle and refined according to some, but the standard kombu + katsuobushi dashi is fine too. Here I have used two ingredients that should be easy to get anywhere. 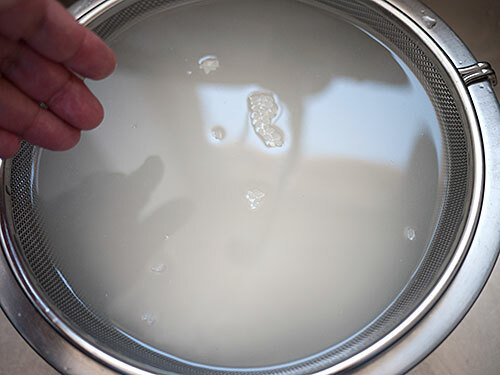 I didn't include any step by step photos here since you'll just see a pan of clear liquid mostly! But here are the steps. 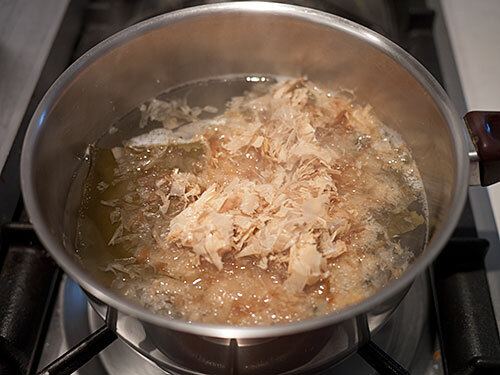 Bring the dashi to a boil, then lower the heat to a simmer. Add the chicken, then add the spinach. Both will cook almost immediately. Taste the soup. 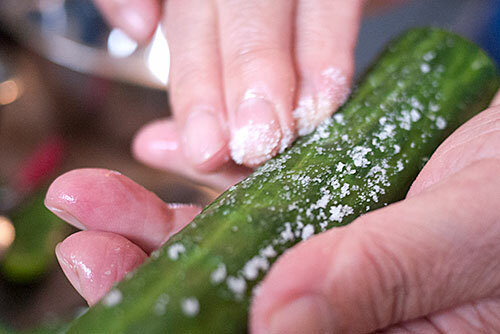 Add a pinch of salt if you think it needs it, then taste again, until it has the right amount of saltiness. So there you have it! 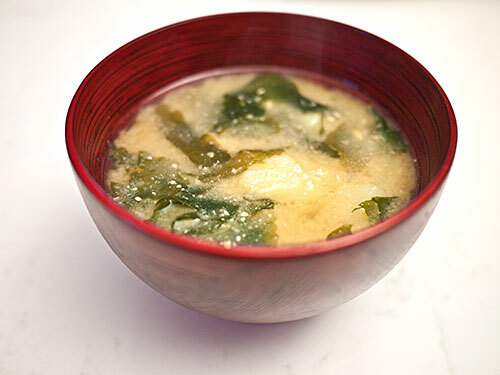 You know how to make great miso soup and clear soup! If you would like to do so, please link to a picture of your results in the commencts right here, via Twitter to @justbento or @makiwi, or on the Facebook page. 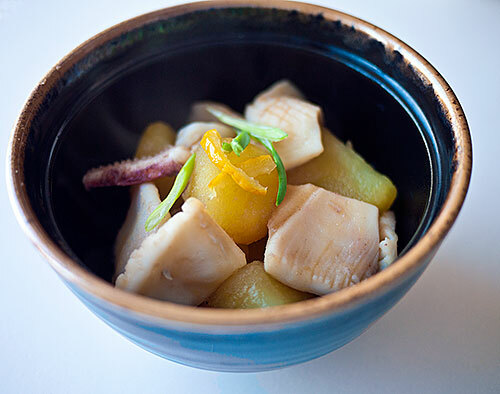 Not all nimono dishes need to be made with dashi. If one of the ingredients has plenty of umami on its own, you can make a dashi or broth from it without having to add any more. One such ingredient is squid (ika) or calamari. 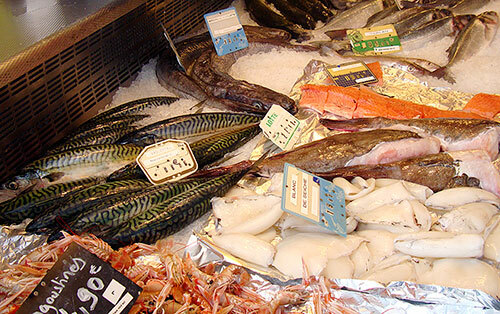 If you live in an area with a sizeable Italian, Greek or other Mediterranean immigrant population, as well as us Asians, chances are you can get a hold of good quality squid. If you can, get a nice one and try this quick and simple nimono. approximately 500ml (2 U.S. cups) cold water Gut and peel the squid. 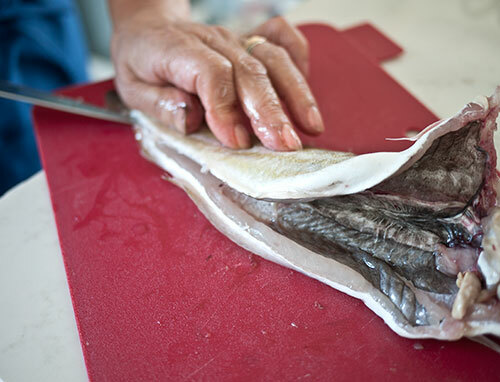 You may want to ask the fishmonger if he can do this for you. Otherwise, here is a good video that tells you how to do it. The advantage of doing it on your own is that you get to use the guts and skin for a bit more flavor in your broth. Cut off some of the legs and cut into pieces. 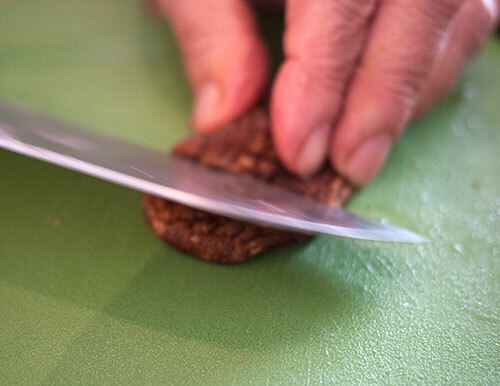 Slice open the body so that it lies flat. Score the surface of the body and the back fins lightly in a crosswise pattern. 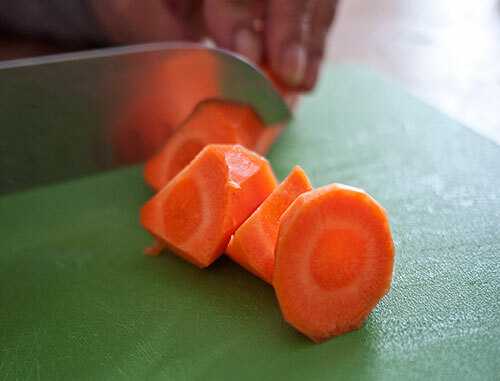 Cut the body into squares about 1-1.5 inches (2.5 - 3cm) in size. Reserve the skin and guts. Peel and cut the potatoes following the instructions in the basic nimono lesson. 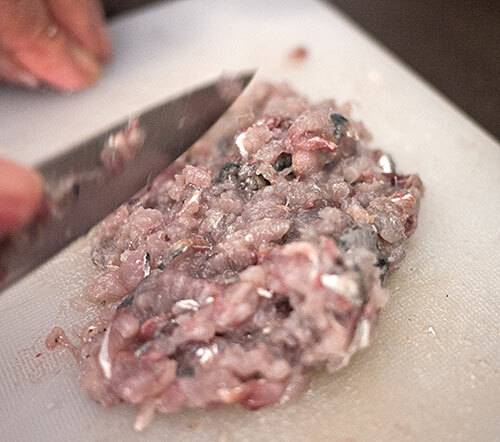 Put the water, squid bits, and squid guts and skin into a pan and bring it to a boil. Put the squid pieces and legs in the water and boil for one minute, no more. Immediately drain the squid, making sure to reserve the boiling liquid. The boiling liquid will be your dashi or cooking broth. 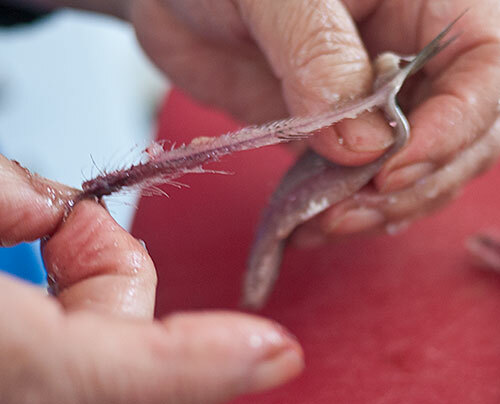 Take the guts and skin out of the blanched squid and discard. Return the liquid to the pot and put the potatoes in. Simmer the potatoes until tender. Put in the sake, mirin and optional sugar, then add the soy sauce. 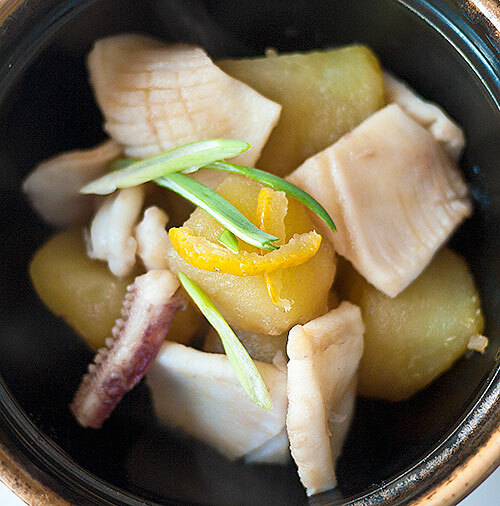 Return the squid to the pot and simmer for an addtional 2-3 minutes. Don't over cook after you re-add the squid or it will turn tough. Taste, and adjust the seasonings if needed. 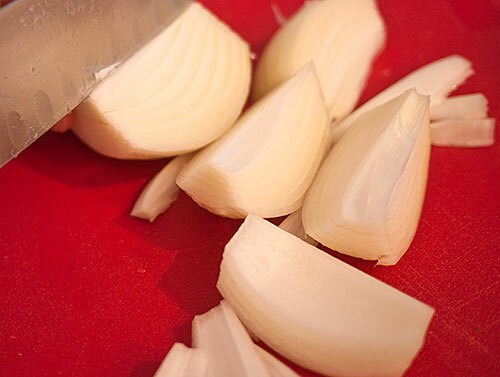 Serve warm or at room temperature, garnished with slivers of onion and lemon or yuzu peel. 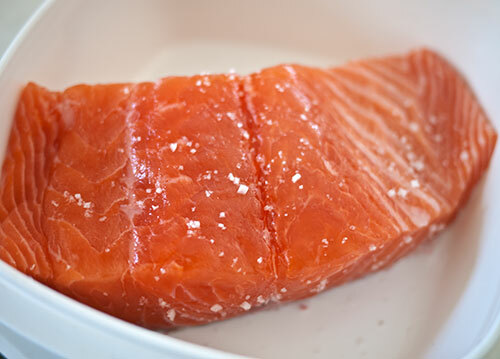 Any kind of protein with lots of umami will work with this method. You may want to try chicken for instance - the dark meat works best. Chicken wings will work well too. Thinly sliced beef or pork work well too. 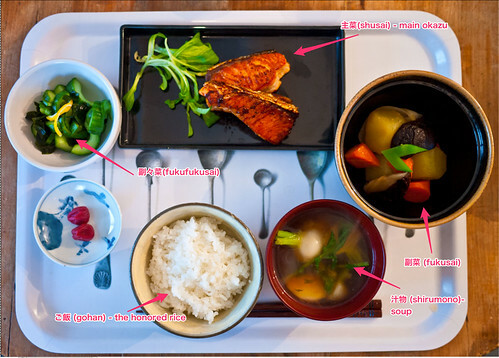 This is Lesson 4 of Japanese Cooking 101: The Fundamentals of Washoku. So far in Japanese Cooking 101, we've covered how to: * Make proper dashi, the base stock used in many savory dishes in Japanese cooking (as well as miso soup and clear soup using that dashi) in Lesson 1; * How to make proper Japanese style rice, the base starch of most meals in Japan in Lesson 2; and * How to make nimono or stewed dishes in Lesson 3. 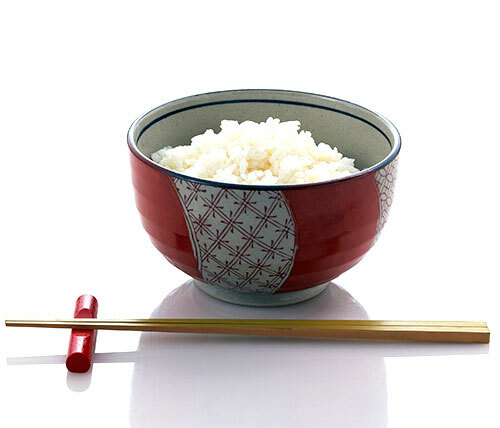 A typical Japanese meal consists of many small dishes to accompany the rice. At least one or two of those dishes is a relatively simple dish called aemono (和え物) a dish of vegetables and sometimes a small amount of protein such as seafood or tofu mixed with a sauce and served cold. 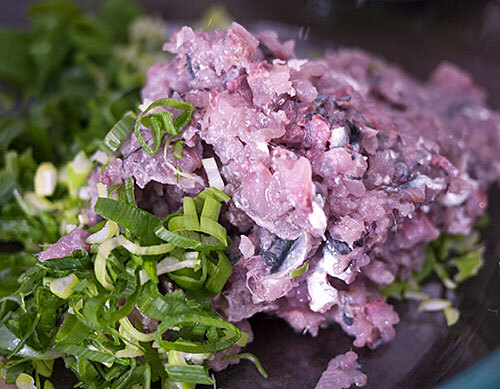 One type of aemono is sunomono (酢の物), a sour-flavored dish. 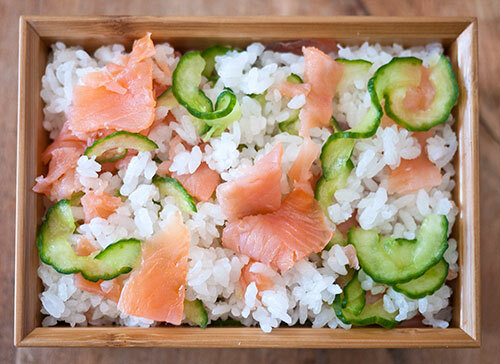 Think of it as a Japanese style side salad, using oil-free dressings. Sunomo are quite easy to prepare, can be made on the spot or a bit in advance, and are very refreshing as accompaniments to richer dishes. In Part 1 we will be looking at the various sunomono sauces. The su part of sunomono means vinegar, so sunomono sauces all consist of vinegar or a sour citrus juice plus flavorings. Collectively these sauces are called awase-zu (合わせ酢) or "combined vinegar". Here are some of the most commonly used awaze-zu, which can all be made in advance or just made on the spot as needed. 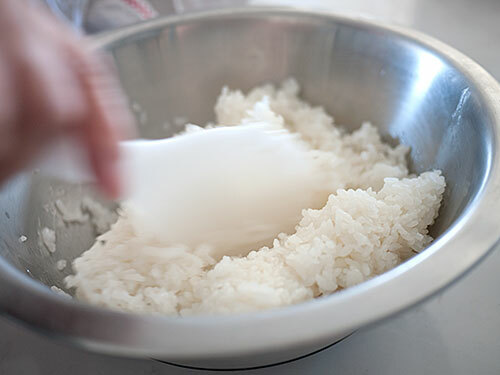 Nihai-zu (二杯酢): 3 parts rice vinegar and 2 parts soy sauce, e.g. 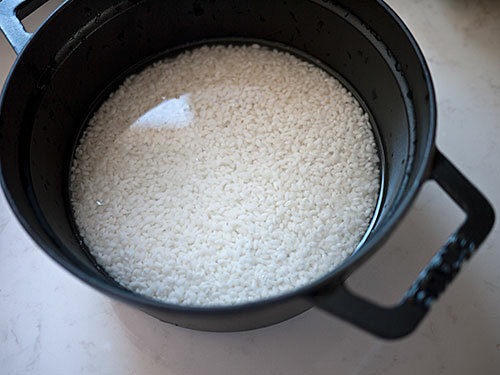 3 tablespoons rice vinegar to 2 tablespoons soy sauce. Just combine and it's done. Sainbai-zu (三杯酢): 3 parts rice vinegar, 1 part soy sauce, 2 parts mirin (you can substitute sugar for the mirin); e.g. 3 tablespoons rice vinegar, 1 tablespoon soy sauce, 2 tablespoons mirin or sugar. Combine and stir over low heat until the mirin has 'cooked' a bit (about 5 minutes) or the sugar has melted, and cool. Ama-zu (甘酢) or "sweet vinegar": 3 parts rice vinegar, 2 parts sugar, a little salt; e.g. 3 tablespoons vinegar, 2 tablespoons sugar, 1/4 teaspoon salt. Combine and stir over low heat until the sugar and salt have melted. See also: Nanban-su (南蛮酢) or Nanban sauce. Classic ponzu: 3 parts rice vinegar, 3 parts soy sauce, 1 part dashi stock, 1/2 part citrus juice; e.g. 3 tablespoons rice vinegar, 3 tablespoons soy sauce, 1 tablespoon dashi stock and 1/2 tablespoon lemon juice, all combined. Sweet ponzu: 3 parts rice vinegar, 4 parts soy sauce, 2 parts mirin or sugar, 1 part citrus juice, 1 part dashi stock; e.g. 3 tablespoons rice vinegar, 4 tablespoons soy sauce, 2 tablespoons sugar, 1 tablespoon lemon juice. Combine and heat until the sugar has melted. Which sauce you use depends on the ingredients you are using in the sunomono, as well as personal preference. Which type of vinegar and soy sauce? The most used vinegar for awase-zu is rice vinegar (米酢), read as kome-zu or (less frequently) yone-zu. This is a very mild vinegar with a slight sweet flavor. You can experiment with other vinegars; for instance, white balsamico is quite interesting, with a pronounced sweetness that may allow you to omit or reduce the amount of sugar in a given recipe. Apple cider vinegar, kuro-zu or black vinegar and so forth are alternatives with distinct characteristics. If you can't get a hole of rice vinegar, try white wine vinegar or apple cider vinegar. The type of soy sauce that is preferred in most awase-zu recipes is usukuchi (薄口) or light colored soy sauce. Light does not mean it has less salt - it actually has more salt than dark colored soy sauce, but it's preferred since it is light in color and won't add any brown tint to the vegetables and so forth. But the "regular" type of soy sauce you can get usually is dark soy sauce, so if that's all you have that's fine too. Some types of awase-zu specifically call for dark soy sauce, such as Nanban sauce (nanban-su). Tamari and other very dark soy sauce types are rarely used in awase-zu recipes, will give a definite brownish color to your dish. But again, flavor-wise they are fine to use, although since they are usually a bit lower in salt you may need to add a tiny pinch of salt depending on your taste. The awase-zu types that don't use perishable ingredients like dashi and citrus juice will keep for a few weeks in the refrigerator, in a sealed container. The awase-zu types with dashi or citrus juice will keep for a couple of weeks, but don't try to keep them for too long. I've given you a lot of information here, but it's really not difficult: just pick one awase-zu that looks good to you (or that's called for in a recipe) and you're ready to go. 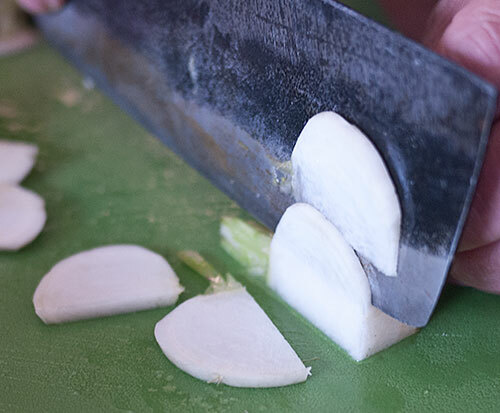 Go to Part 2: How to prep various vegetables for sunomono. 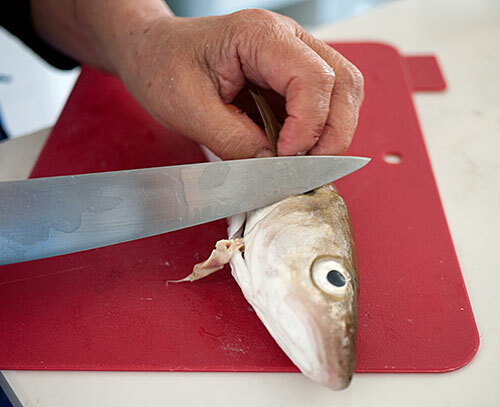 We are entering the home stretch here for both Lesson 5, Fish and the whole Japanese Cooking 101: The Fundamentals of Washoku course. I hope you've been enjoying it so far! 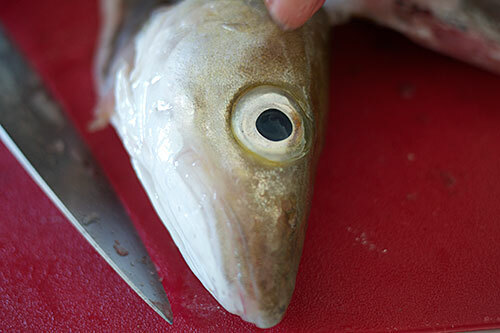 In this lesson we are going to get very intimate with fish. 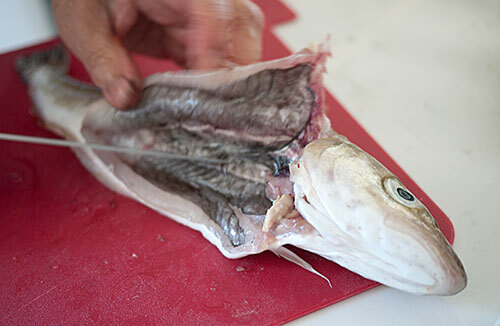 Basically all fish needed to be prepped the same way: the head taken off (sometimes the head is cooked with the fish or separately); de-scaled if it has prominent scales; gutted, and then usually fileted and/or boned. And usually you need a sharp knife for these operations. 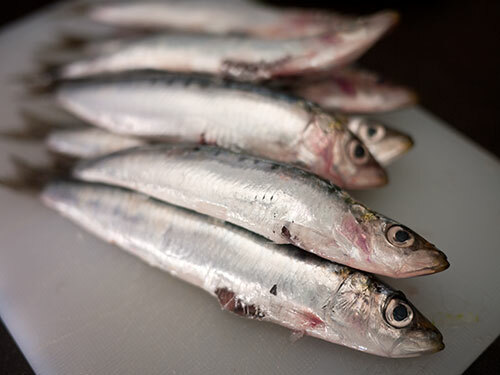 However, with small fish like sprats, sardines and anchovies, you don't even need a knife at all, except to take the heads off. They are tender enough that you can just prep them with your hands. This is a great way to really get to know a fish, and it's kind of fun too. This is a plate of fresh sardines, popular around the world, especially in the two places I spend the most time - Japan and southern France. Beautiful, aren't they? They have nice clear eyes. The one thing you do need a knife for is taking the heads off. You could pull them off, but that's a bit messy. So, here are the beheaded sardines, with some of the ingredients we'll be using with them later to make the plate look prettier. 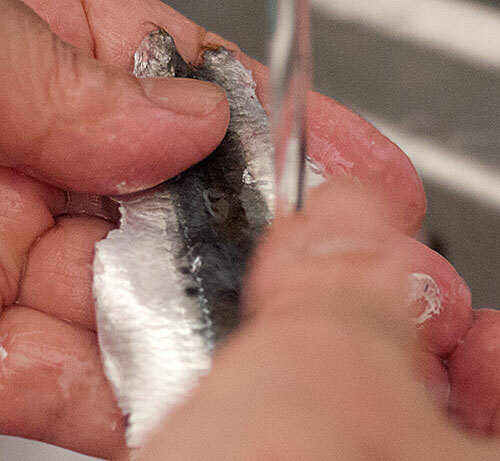 To deal with the sardines, position yourself at your sink and have a thin stream of water running out of the tap. The next thing is to take out the bone. This comes off easily in one go. Pry it off at the head end, and just pull. Don't be hesitant. Give it a tug and it's gone, tail and all. Don't throw away the bones by the way! Put them on a plate to deal with later. 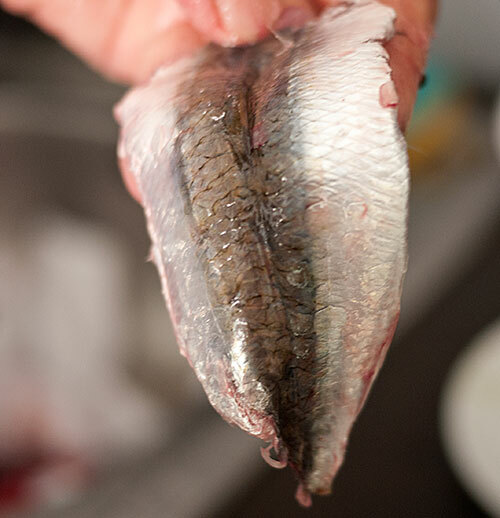 Here's the gutted and boned sardine - so easy! 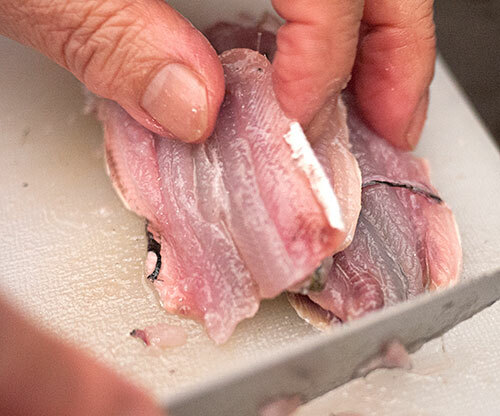 At this point, run your finger carefully down the surface of the fish. If you feel any little bones left in there (which you shouldn't if you ripped out the backbone properly) take them out with your fingernails or a pair of fish bone tweezers. 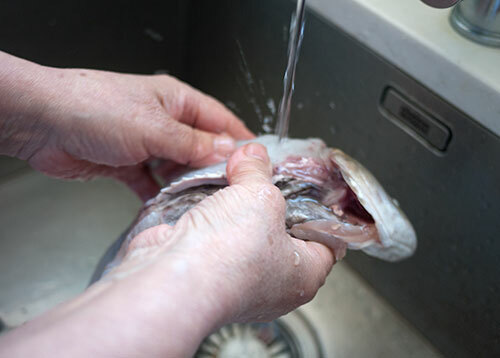 Wash each filet again to get rid of any stray bits of guts and stuff. 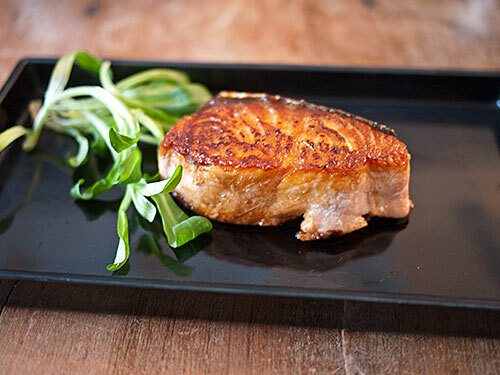 This next step is somewhat optional, but does improve the texture of your fish. 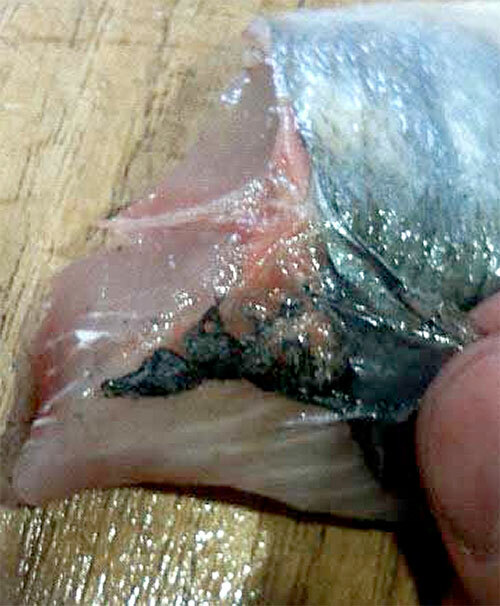 The skin of the sardine peels off quite easily. Just pry up a corner with your thumbnail, and pull it off in one go. As with the bone, don't hesitate here or the skin will rip and it becomes harder to take it off. Here are the skinned filets. Put them on absorbent paper towels to drain off the excess water. 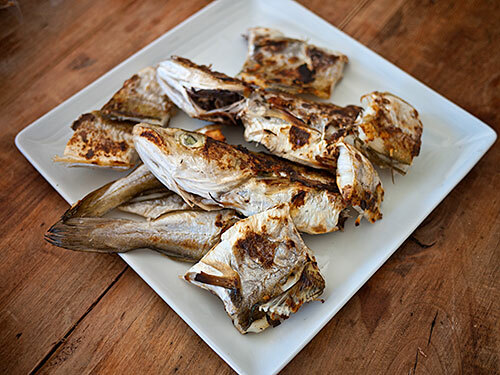 At this point you can pan-fry them in a bit of olive oil or butter (maybe coat them with flour or cornstarch first), or marinate them, or whatever you like to do with such fish. You can even turn it into sushi! 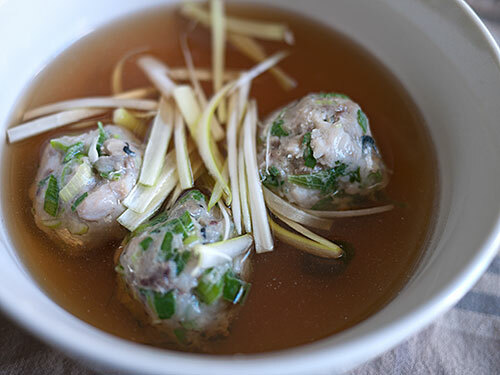 Here is a classic way to use sardines, Iwashi no tsuire-jiru - Sardine balls in clear soup..
Now that you know how to gut, bone and clean sardines, one of the nicest ways to eat the sardines is to turn them into little fish balls which can be floated in a hot pot, pan-fried, and so on - or most classically, served in a clear soup. 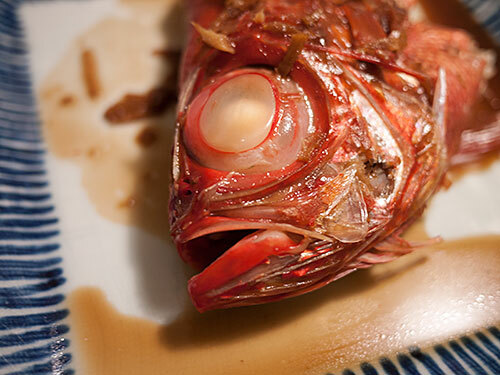 The ginger and onion takes away any kind of 'fishy' taste. 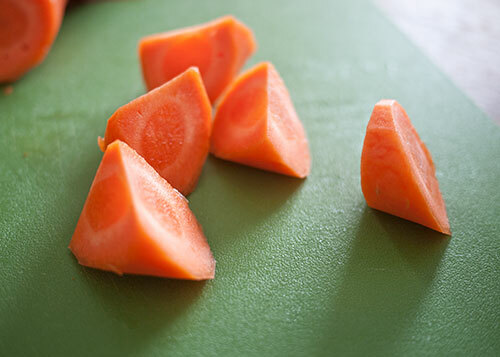 You can even serve this in cold soup for a refreshing change. 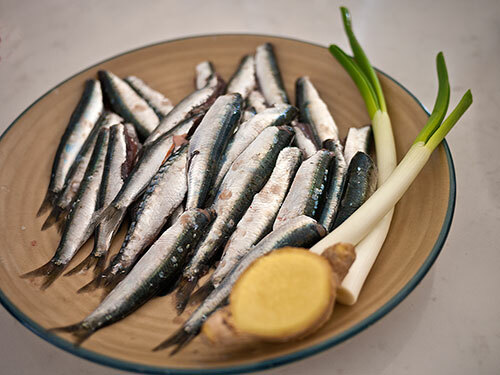 They are very healthy too, since sardines are one of the best sources of the heart-healthy omega-3 fatty acids EPA and DHA. Gut, bone and de-skin the sardines as per the detailed instructions here (link). 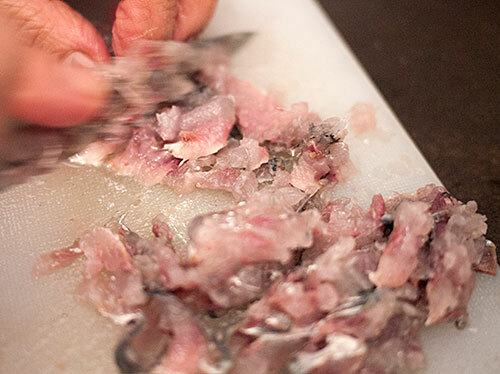 Start chopping up the sardines. First just slice them up. 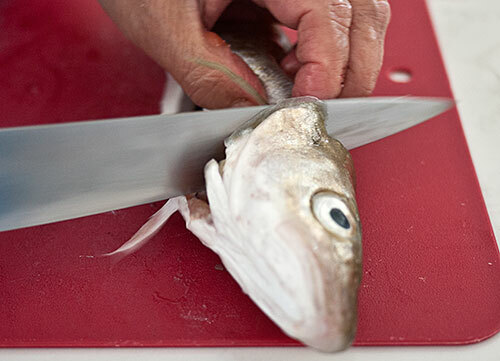 Keep chopping the fish until the pieces get smaller and smaller.You can also bash the mixture with the side of your knife occasionally. Put the chopped up fish, ginger, green onion, sake, salt and egg white in a bowl. 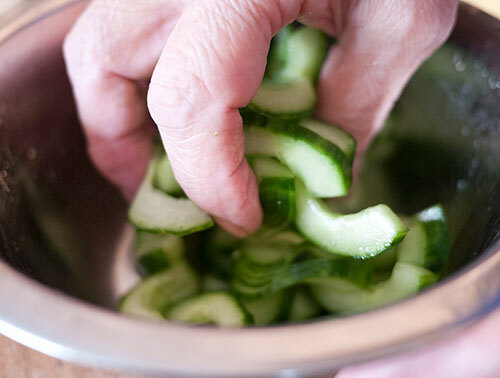 Mix together thoroughly with your hands until it forms a slightly sticky paste. Form into balls with moistened hands. (Some people prefer to use two spoons that have been dipped in oil to form the balls, but I just use my hands.) You should have an equal number of balls per serving, around 3-5. 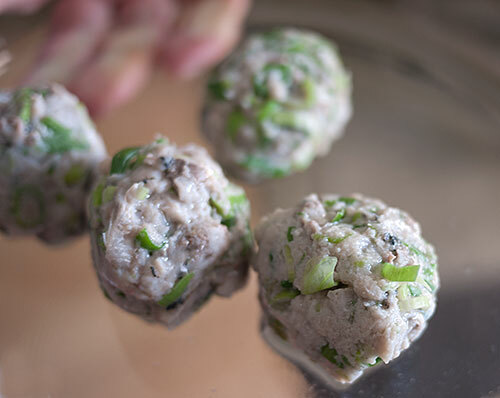 Lightly roll the balls in cornstarch (cornflour) or potato starch. 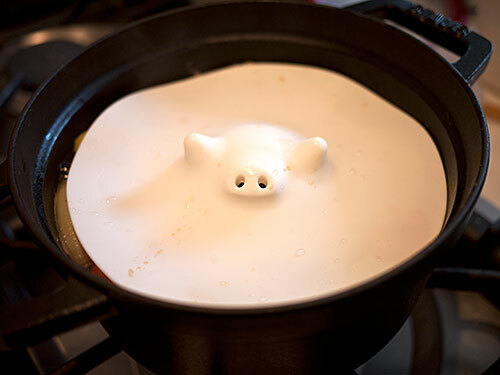 Drop them in a pot of simmering water, and poach for 4-6 minutes until they are firm, and white on the outside. Take them out and drain well. 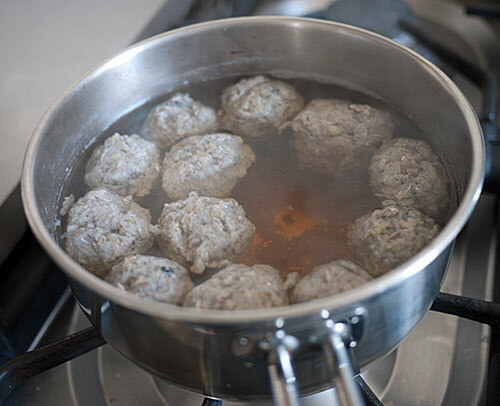 At this point you can use the precooked balls in hot pots, oden stew, or pan-fried gently and served on its own or with a little ginger-wasabi sauce. Heat up the dashi stock. Add the tsumire (sardine balls) and gently heat through. Serve piping hot or chilled until it's ice-cold, with julienned green onion or the white part of leek, and/or julienned ginger. 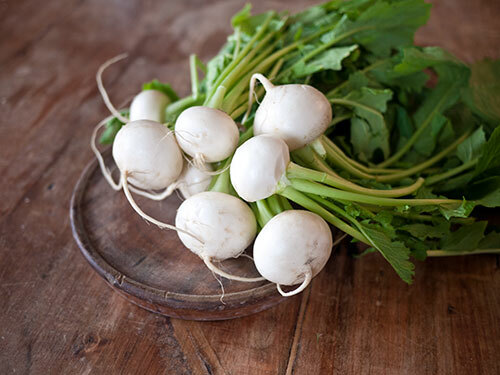 You can also add mitsuba, komatsuna, or even watercress to the soup. Some crunchy greens are especially nice in this if you serve it chilled. A sprinkle of sansho pepper on top is great too. At the sushi restaurant in New York I worked at many years ago, the chefs used to serve these as extra treats to customers who sat at the counter. 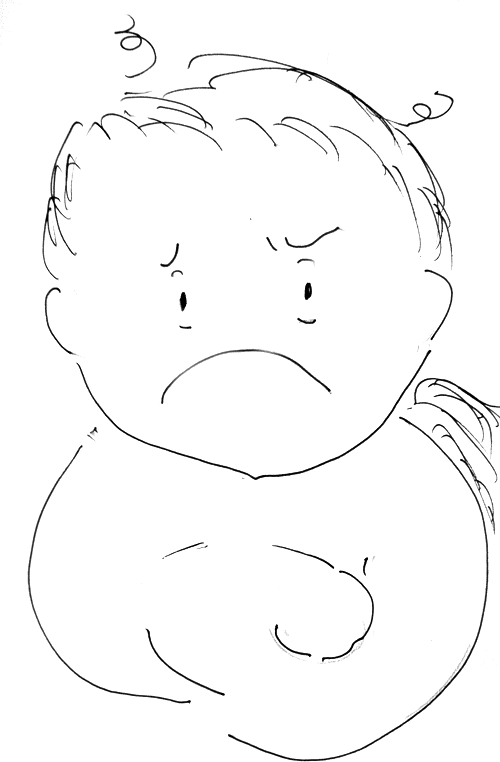 One of those was a lovely little girl, who used to come regularly with her father. She just loved those fish bone crackers. One year the chefs made a big batch of them and gave her a takeout box full for her birthday. She was so happy I thought her eyes were going to pop out of her head. 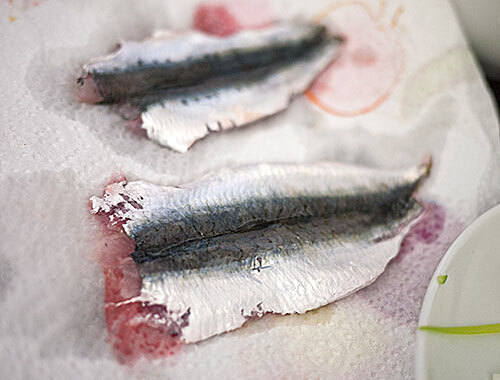 A frugal way to deal with the bones taken out of small fish like sardines. 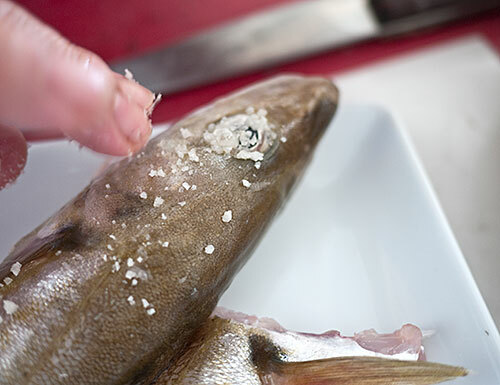 Tip: Always fry the potatoes before you fry the bones, or the potatoes will take on the flavor of the fish. 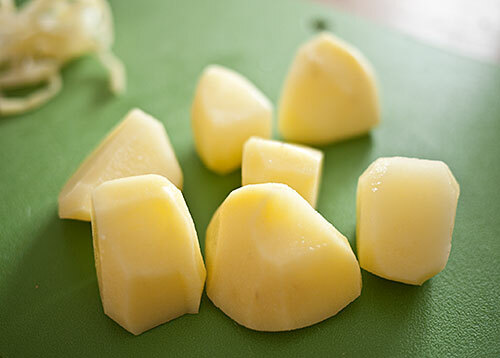 Peel the potatoes and cut them into small matchsticks. 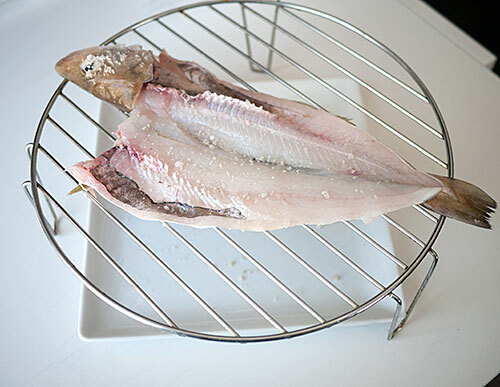 Rinse them and then pat them dry, and leave on a sieve to dry out some more until you're ready to fry everything. 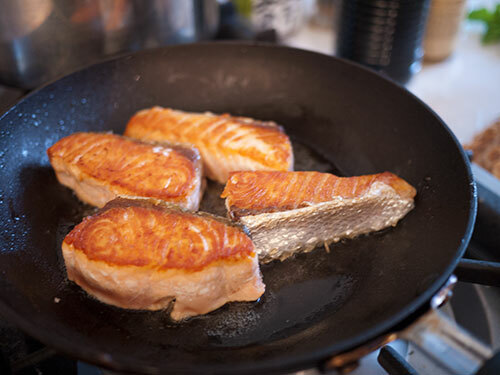 When you are ready to cook and while the oil is heating up, coat the fish lightly with flour or cornstarch. 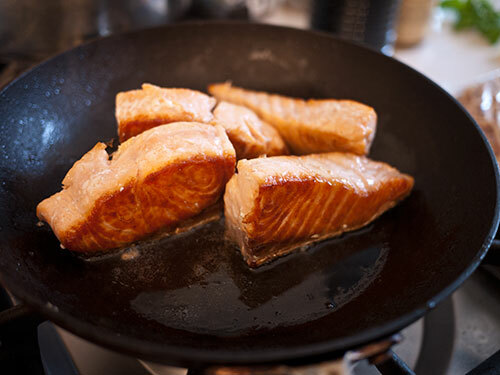 Heat up some oil for frying. Heat the oil to a low cooking heat, about 170°C / 340°F (see this for how to gauge frying oil temperature with wooden chopsticks). Fry the potatoes until cooked but not browning yet. Take them out and drain. 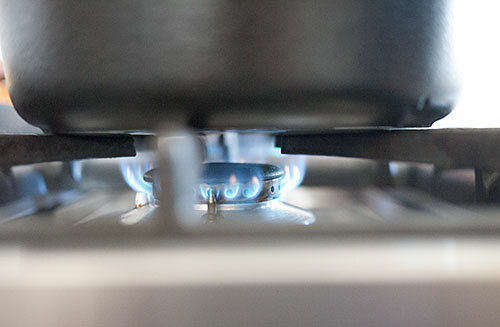 Heat up the oil until it reaches the high range, about 180°C / 355°F. 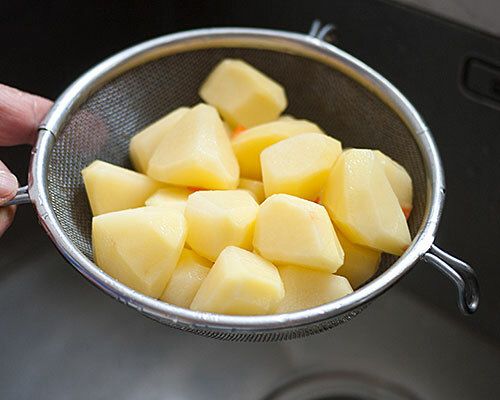 Put in the pre-cooked potatoes and fry until a golden brown. Take out and drain. Put the fish bones in and fry until golden brown and crispy. Take out and drain. Lightly salt the fish and the potatoes. Serve as a snack or appetizer. It goes very well with beer. Welcome to the last lesson in Japanese 101: The Fundamentals of Washoku. I hope you've enjoyed the course and learned a few things along the way. In this last lesson we'll take a look back at what we've learned, and also see how to put it all together to great an authentic traditional Japanese meal at home. First we looked at the basic pantry ingredients for the course, which are also the basic pantry ingredients for a traditional Japanese kitchen. Then learned how to make proper dashi stock, which is the foundation of many savory dishes in Japanese cooking. We also learned how to make miso soup and clear soup using that good dashi stock. 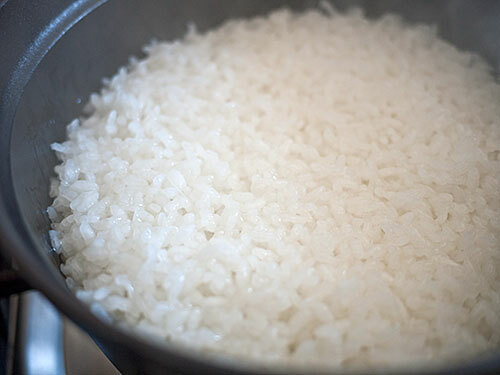 Next, we took a good hard look at how to prep and cook Japanese style rice. 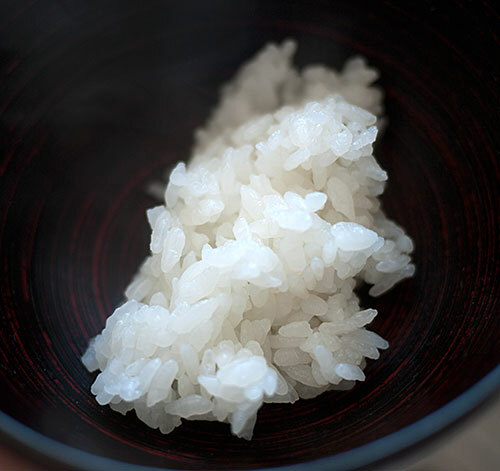 Rice is central to Japanese life, not to mention most Japanese meals. 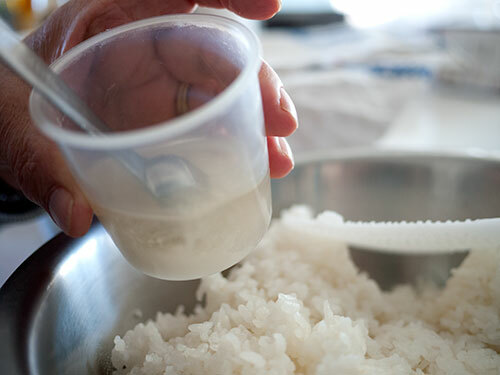 We also learned how to make sushi rice. Then we got to the dishes that go with the rice and soup, starting with nimono or simmered dishes (even without dashi). We went on to sunomono and aemono - basically prepped or precooked vegetables with some kind of sauce. 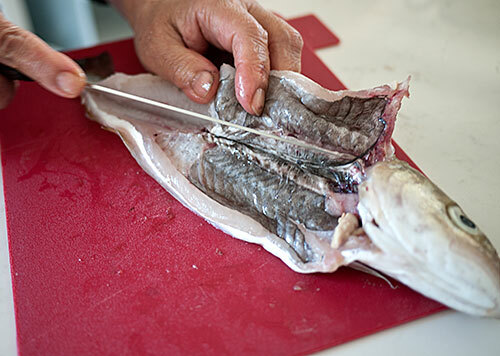 We then ended by looking in-depth at arguably the most important protein used in Japanese cooking, fish, from a simple teriyaki to whole fish opened up to breaking down whole small fish and using every part of it. If you missed the course by the way, just follow the links in the paragraph above in sequence! Or, just start at the very beginning intro, then go to the first article linked below that, required ingredients. After that just keep clicking on the 'next' article link below each article. Dashi is so fundamental to traditional Japanese cuisine that it's important to know how to make it and how to use it. This way of thinking - flavoring something with a little umami - permeates other types of cooking in Japan too. Soup also is a part of most meals, even breakfast. The other dishes are basically side dishes to the rice. 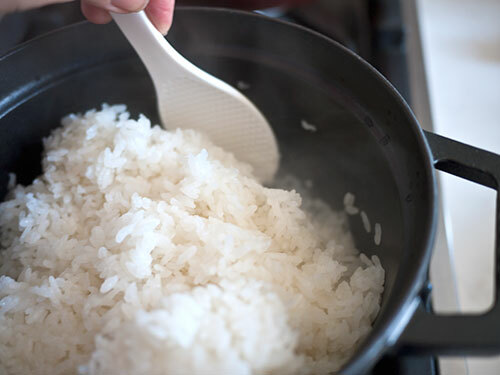 In Western style cooking, the main protein is the 'star' of the meal, but in Japan the rice is the unquestioned king of the table. Everything else on the table is judged by how well it goes with that plain bowl of rice. 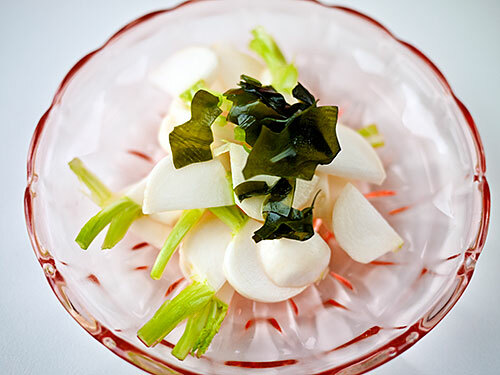 The word for all of these side dishes is okazu (おかず)__, or more formally, fukusai (副菜). 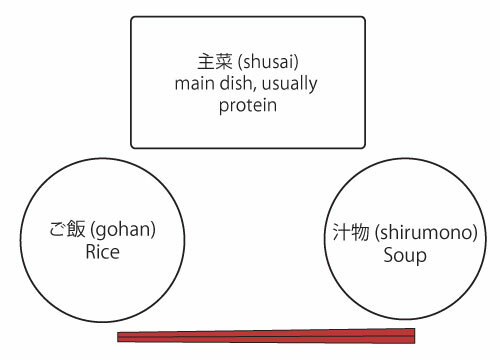 The bare basic Japanese meal is 一汁一菜 - ichijuu issai - 1 soup, 1 side dish, plus the bowl of rice. Traditional Japanese meals are served in multiple serving containers, one for each item. And there are some basic rules to follow as to how to line them up. 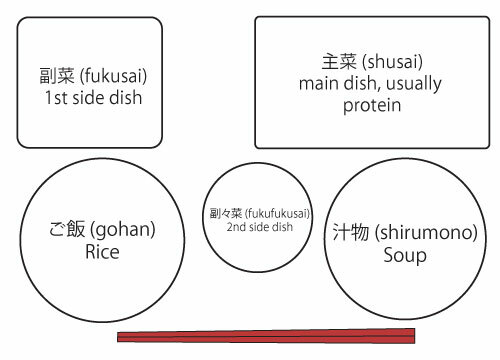 Here's how to line up a basic 一汁一菜 - ichijuu issai - 1 soup, 1 side dish, bowl of rice meal. This is how the full 一汁三菜 - ichijuu sannsai - 1 soup, 3 side dishes and rice meal is arranged. There are no rules really to dictate where the side dishes go in relation to each other. But again, the rice and soup are closest to the diner, with the rice on the left. Plus, the main fukusai or side dish is in the most prominent position. The little dish of umeboshi is not really considered to be a proper side dish so you can ignore that, but as you can see the rice is on the left, soup on the right, and the side dishes beyond that. 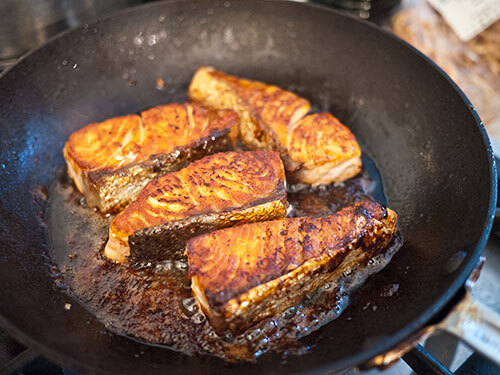 As I mentioned in the salmon teriyaki chapter for fish, the skin side goes on the top or the far side; the same goes for a piece of skin-on chicken for example. 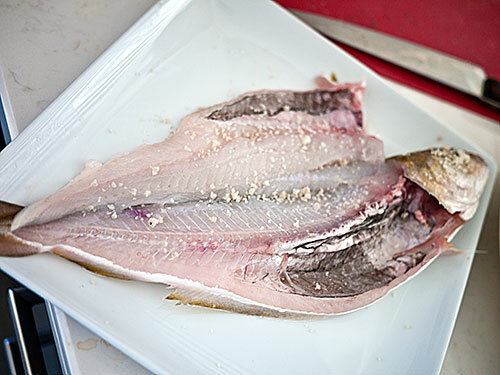 If you are serving a whole fish the head goes to the left. When you put a Japanese meal together, pay attention to the balance of flavors and cooking methods. Ideally you should aim for 1 yakimono （焼き物), something cooked with dry heat - grilled, pan-fried, or deep fried; 1 nimono （煮物), something simmered, and 1 aemono (和え物) or sunomono (酢の物) - a cold dish with a sauce, dashi based or vinegar based. This gives a good balance of flavors and textures. 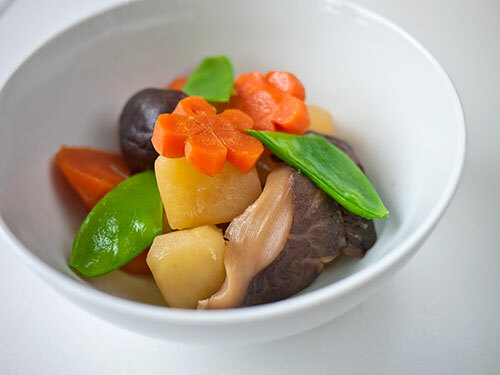 While the yakimono is usually a protein, the two other sides can be all-vegetable, or contain a little protein (e.g. a little seafood), and so forth. 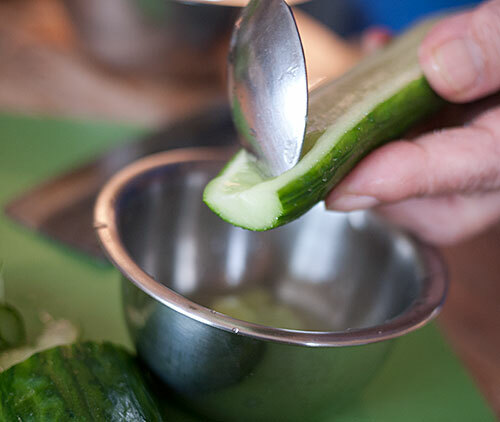 In practice, on an everyday basis most families would have maybe 2 side dishes plus some pickles or something. But this is the ideal anyway. 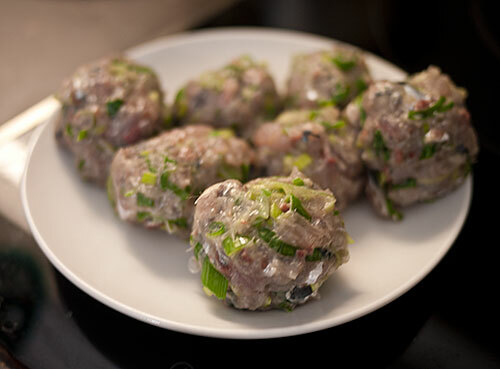 And it's not impossible to achieve since many dishes can be prepared in some bulk in advance, especially the nimono. 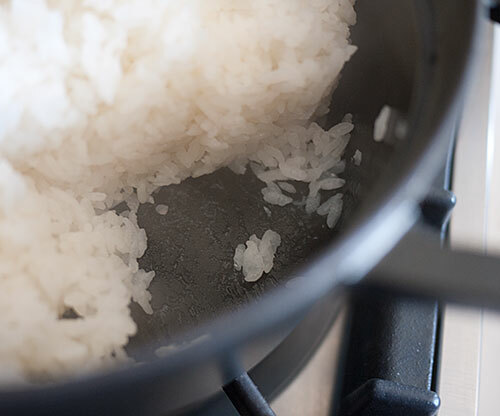 What makes things a little easier for the cook when preparing Japanese food is that not everything has to be piping hot. The soup certainly should be, and the rice should be freshly cooked and hot too. And some yakimono or protein dishes should be too. But the side dishes to round out the meal don't need to be. There are a lot of recipes on the site that you can use for any of these categories. Take a look! So how was that walk through the basics of washoku, traditional Japanese cuisine? I hope it was interesting. For people who were looking forward to more fish lessons, I've decided to hold off on them for a bit and possibly put them in a more advanced course down the line. Stay tuned! I'm also planning at least one more 'course' series like this this year, but I'm still open to ideas about what it should be about. If you have some ideas please tell me in the comments. One I wanted to address in particular is the accusation, if you will, is that the lessons do not represent that way most people cook in Japan anymore. One person even opined that I was not a 'real Japanese' because I didn't cook like 'the Japanese people I know in Tokyo' or something like that. Well you know what, that person is right about one thing: Many (not all!) people in Japan don't take the time to make their own dashi from scratch, or grow their own shiso or other herbs. 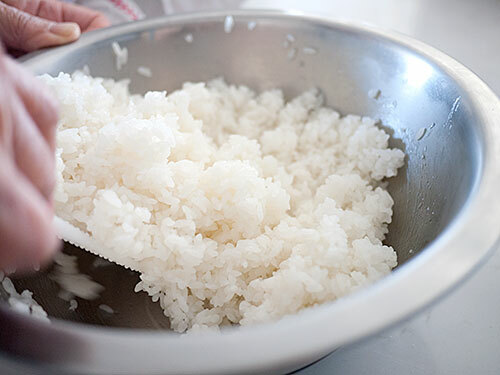 Some rely on prewashed rice called musenmai (無洗米) so they don't have to bother with rinsing rice either. 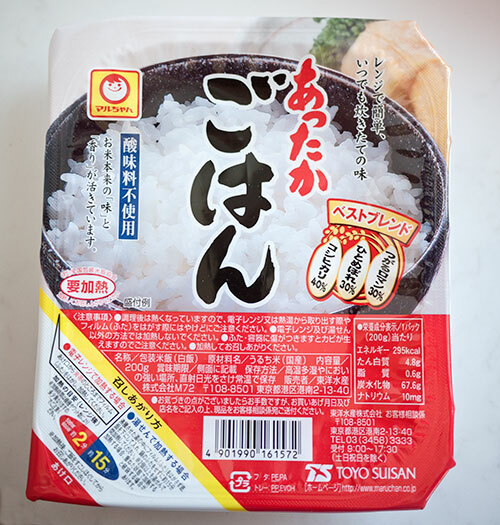 A lot of recipes on various Japanese cooking sites call for the use of mentsuyu (めんつゆ), bottled noodle sauce concentrate, a ready-made combination of soy sauce, mirin, sugar, and dashi. It saves time having to pull out each individual ingredient and adding it one by one, for sure. 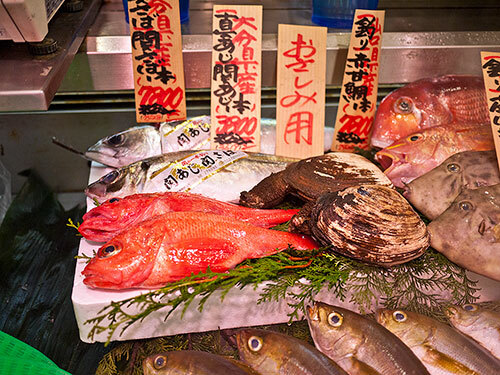 There are just as many convenience foods and ready-made foods in Japan as there are anywhere else - not to mention tons of restaurants, fast food places, and the like. You can easily avoid having to cook, ever. And sadly, a lot of people are like that. Japan is after all one of those so-called developed countries, where conveniences abound. The whole point of the Japanese Cooking 101 course was to show how things are done for the best possible results, using traditional methods. Most of the readers of my sites do not live in Japan. I'm not writing for a Japanese audience obviously, since I'm writing in English. I'm not even writing for an audience of English speaking residents of Japan - although I know there are some who've been following along for years (hi guys!). (My column in The Japan Times on the other hand is aimed at English speakers in Japan, so has a rather different focus.) Unless you live in a city with proper Japanese groceries, it can be very hard to get a hold of the right ingredients. Things like mentsuyu are often too expensive to rely on all the time. Let's face it, most Japanese ingredients are expensive outside of Japan, if you can even get a hold of them. If you're going to try to make proper tasting Japanese food under those circumstances, I would much rather you spend your precious money on basic, fundamental, real ingredients rather than manufactured convenience products. If you have access to a Japanese grocery store you can get things like mentsuyu, or the Japanese equivalents of Hamburger Helper and the like. But they're expensive - too expensive for everday use. On the other hand, although soy sauce, mirin, sake, konbu seaweed and bonito flakes to make dashi, plain old miso and so on are not cheap either, they're a much better investment of your money if you want to create many authentic tasting dishes. The point is, I want to be able to teach a little bit about how to cook Japanese food the proper way, through my sites, my book and my other writings. Cooking from scratch is, in my opinion, a fundamental skill, and I'm fighting the battle to keep that skill alive. Even if that notion is laughably old fashioned for some people.